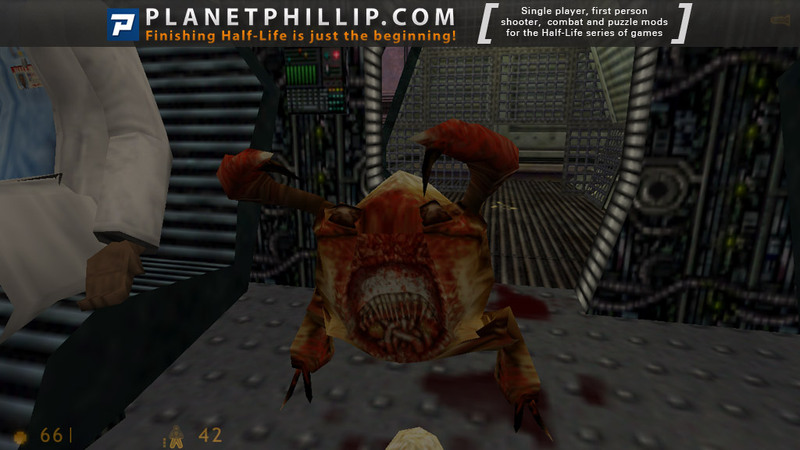 USS Darkstar is a futuristic episode for Half-Life set on a Zoological Research Vessel. This mission occurs in the year 2066, but since you have already travelled to the future before, this should not be a problem for you. The space-time window to come to our present time will be available in just a few days, please decide ASAP about your interest in this job opportunity. You have been selected for this position by Cmdr. Neil Manke due to your broad knowledge on advanced biochemistry and extensive experience interacting with hostile aliens. Your proven capacity to survive under critical conditions was also considered. But actually you don’t have anything to worry about, our project is adopting the most rigorous safety measures to prevent incidents. I can personally guarantee everything is under control and none of the crew will be ever submitted to any risk situations whatsoever. This is certainly going to be a calm, quiet and relaxing journey, as you can already predict from the pictures of our impressive spaceship installations at The Black Widow’s Lair. This was March 2016’s Classic of the Month mod. 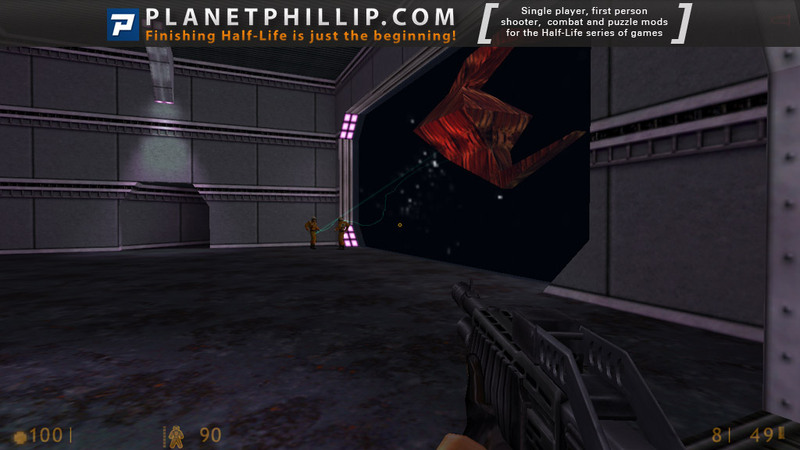 Copy the darkstar folder into your Half-Life folder. USS Darkstar should now be listed in your Library tab. 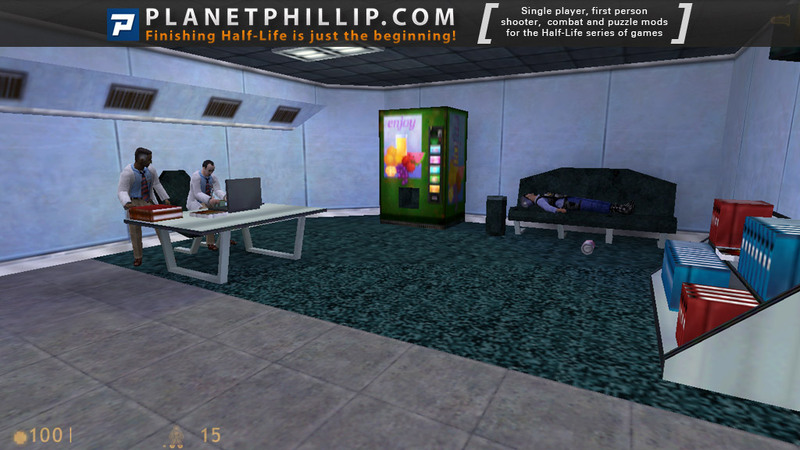 The author of this mod is actually Neil Manke, he of They Hunger fame. You know what that means, folks. Yep, you’re in for a real treat with this one. 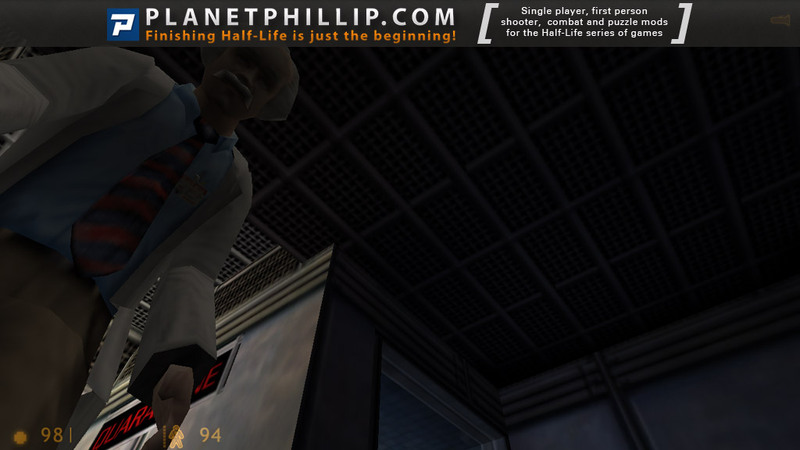 Once again you’re Gordon Freeman, and once again you’re in a lab – only this lab is an a ship flying through space. 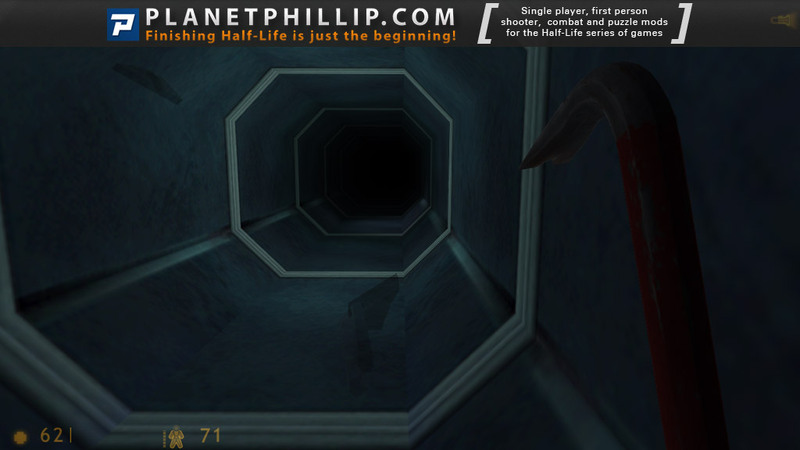 Of course, something goes wrong (it wouldn’t be much of a mod if it didn’t!) and you have to escape. And escape you will, though all areas of the ship. You’ll see the dark underbelly of the cargo hold, the remains of the research labs and the technology of the mainframe. This is an excellent mod. 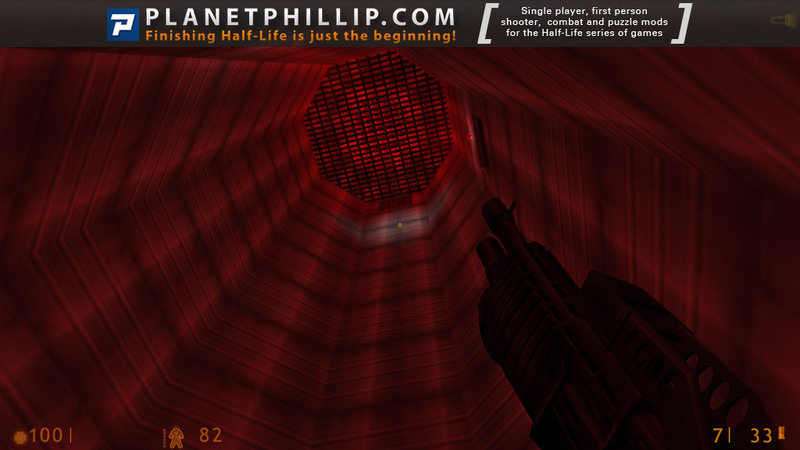 It really conveys the feeling of being in space well, something few HL mods succeed in doing. 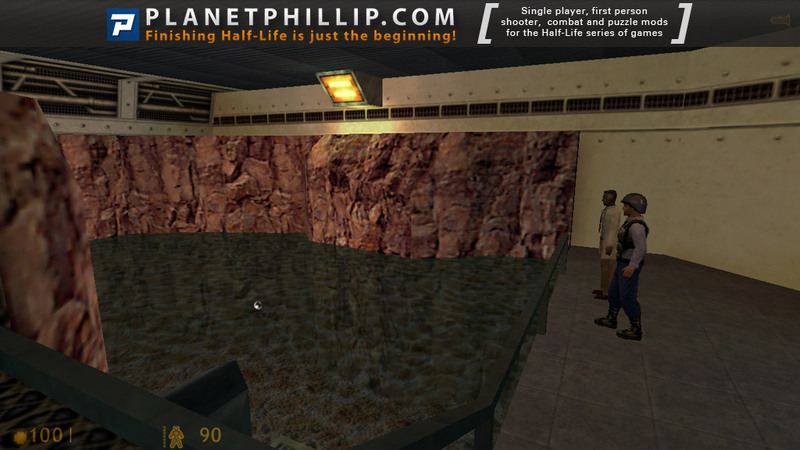 The maps are very well designed, and the new voices and graphics, limited though they are, are of a high standard. Everything we’ve come to expect of Neil, really. Downsides? There aren’t any, really. I seem to have developed a nack for reviewing the best mods out there. Occasionally you may have trouble figuring out where to go, but when you do figure it out you’ll be wondering why you didn’t spot it before. For the most part, it’s al very clear. Two things I forgot to mention in my little review. One) There’s no human marines to fight – it’s all aliens. Two) There is a remarkably fun section where you are shrunk down and have to navigate your way across someone’s office. The cutscenes in this are well made and some are quite funny too which I won’t spoil. Action can be tough sometimes but possible and not too hard. There is plenty of ammo and health in the mod and you shouldn’t run out of it too soon. Sometimes the mod can get a bit too much of the same thing but it’s still fun to play through and get to the end. Quite average although good. Texture can be wierd in some areas but generally thought out well and aligned with care with good texture choices. Structure of most rooms is simple but stll defines what the room is supposed to be. Lighting is also good in most places but a few areas could do with improvements. Many areas are also large and well detailed. A good mod from a well known author with simple yet good design and fair gameplay. As I sit in front of the screen I see a gigantic ship, deep in outer space, swoop past the camera, I use the term swoop loosely because the process almost takes a minute due to the size of the ship. When the camera eventually reaches the end, it pans over the ships mighty engines, burning at full thrust, and over the top to give a better view of the ship. Lights, landing bays, glass tunnels and windows suddenly reveal themselves, the camera zooms in to one of the said windows, we can make out some sort of dormitory, a security guard walks in and bangs on one of the doors, but the noise of the bang is drowned out by the sound of the blazing engines. Now anyone reading this, oblivious to the fact that it’s a review for a computer game level, would think I was describing a cinematic scene from a Starwars movie, or similar high budget Hollywood movie. They’d be wrong of course because it’s in fact the splendid scripted intro to Manke’s new single player level pack, USS DarkStar, I’m impressed already and I haven’t even started playing yet. 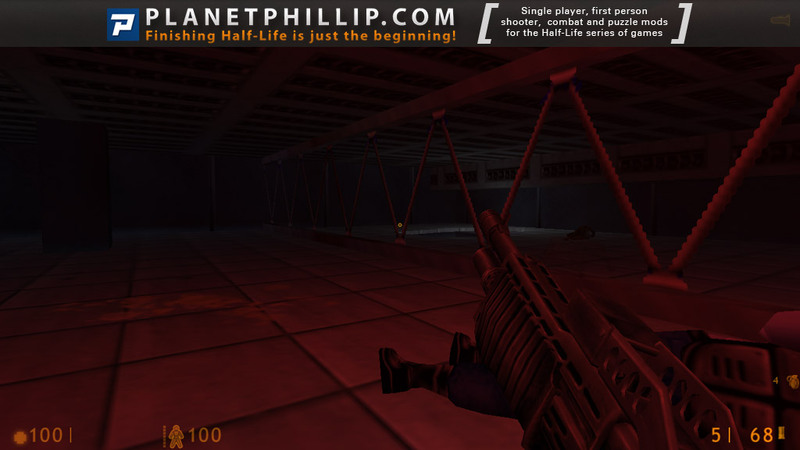 Before I downloaded this level I heard many boast’s and rash statements about this pack, claiming that it bettered any of Valve’s efforts, and that it was worthy as a mission pack on it’s own alongside the upcoming Opposing Force. After playing through DarkStar twice it has to be said these statements aren’t far from the truth. Playing through DS is like playing through a real movie, like an interactive movie except that’s there’s no FMV in site, just realtime 3D graphics. 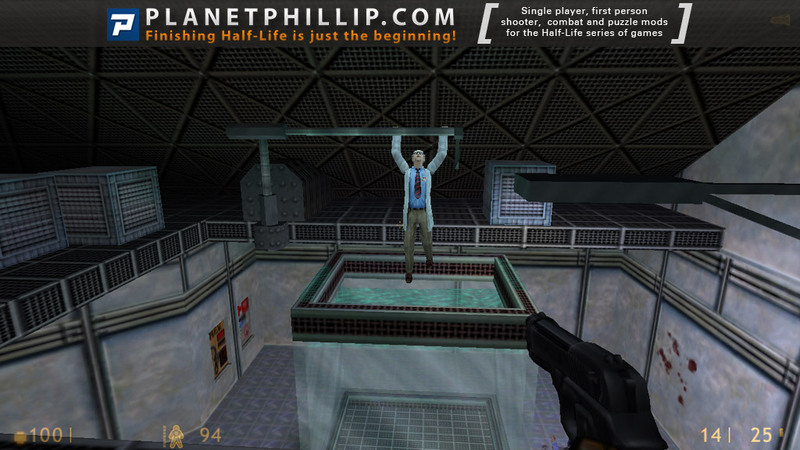 The author has made good use of cinematic cut scenes, from the flyby intro to the ending sequence, and scripted sequences such as the sound of scientists getting slaughtered as they call for help over the intercom. There’s plenty more where that came from but I shouldn’t spoil the surprise, this professional use of scripting really helps add to the experience moving the story along at the same time. It draws you into playing the game, so much so that you’ll find yourself playing through the whole thing in one sitting, oh and did I mention that it’s big! 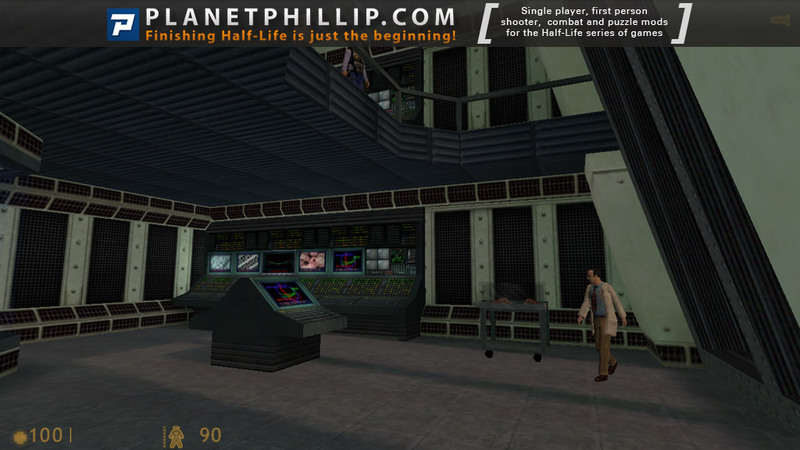 The story goes along the lines of Gordon Freeman being assigned onboard a zoological vessel in outer space in 2066. 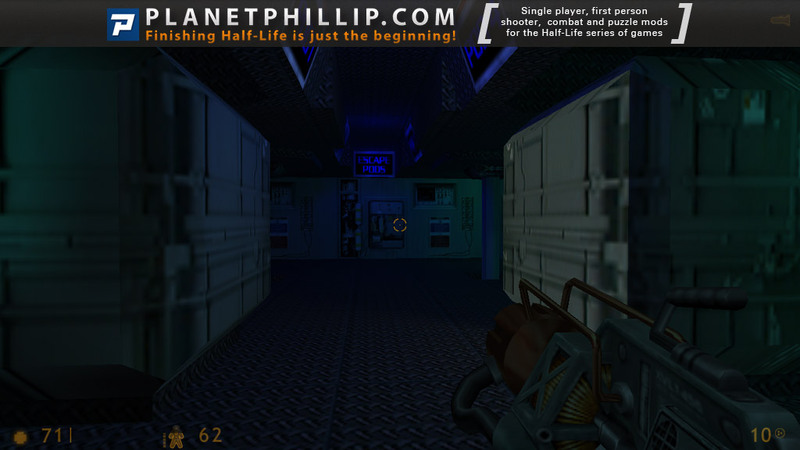 It starts off in the same vein as the original Halflife, you’re late for work and as you make your way through the ship everything is rosey and all systems are go. Until everything goes wrong of course, and then begins the battle for your life as you desperately try to find a way off the ship blasting aside any escaped aliens that get in your way. 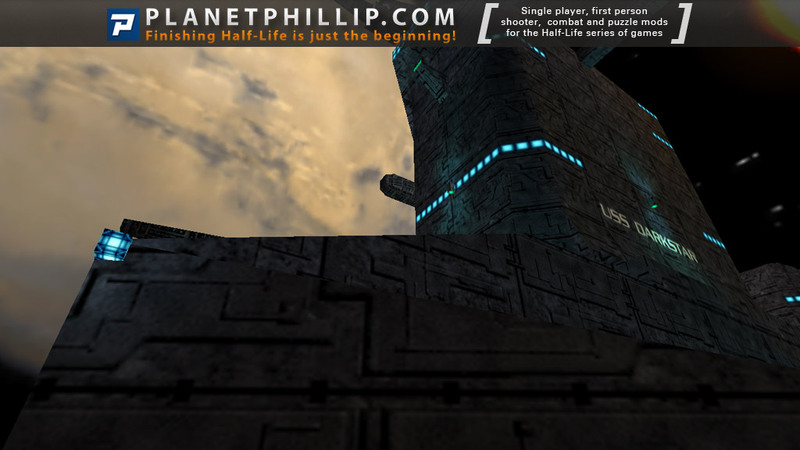 The level design is first rate, it’s if though WorldCraft is Manke’s second home. Glass tunnels that let you see outside the ship, open up into detailed corridors complete with all the trimmings and supporting structures you’d expect in the real ship, these then lead onto offices and labs where even the tiniest of details, such as notebooks and pens, are present. The monster play pens, complete with monsters, that allow you to walk right through them protected by an electrical force field so they can’t touch you, are a great touch. 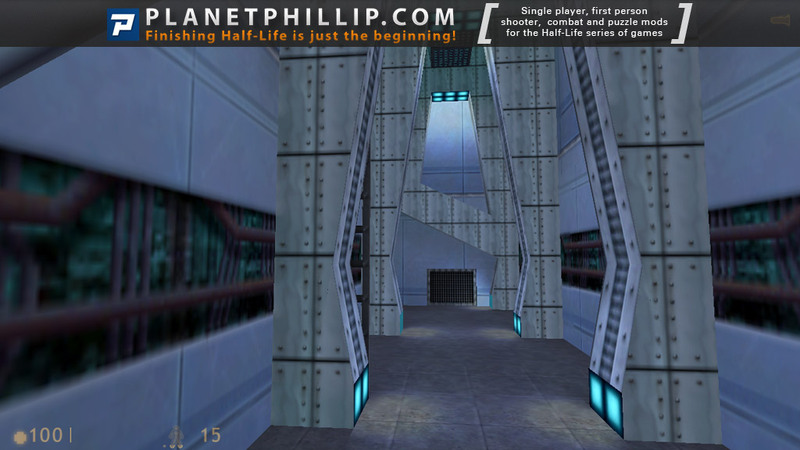 However, although the levels are really detailed, at times it didn’t feel like I was walking through a real spaceship in 2066, the designs tended to resemble the standard corridors and rooms you see in Halflife’s underground bunker/lab type levels at times. This can be forgiven though because the authenticity and attention to detail more than makes up for it. 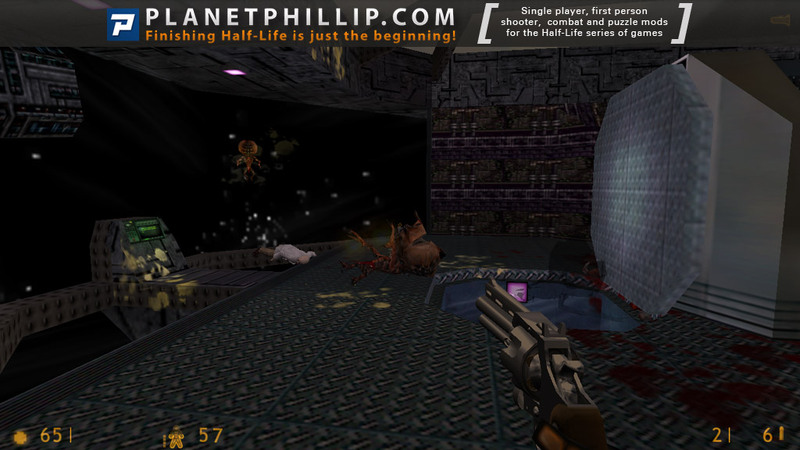 The almost perfect monster and weapon layout is testament to how important beta testing your levels is (like DS was), the game never gets too difficult or too easy, the difficulty remains consistent throughout, and you never find yourself having to battle through parts of the game with just a crowbar because the designer forgot to leave enough ammo. 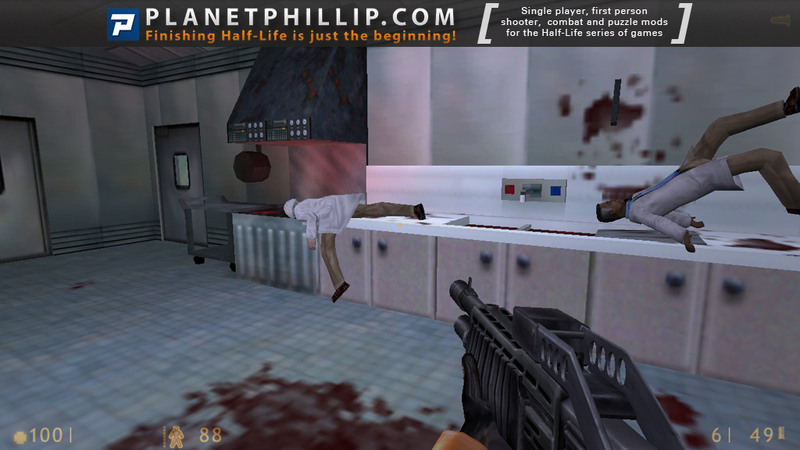 These levels are packed with innovation and originality and comical touches that put a smile on your face, for instance, when you come across your first PC Gamer magazine with ‘top 100 Games of 2066″ braising the front cover, and when you come across the security guard laying down on a sofa with a beer can lying on the floor, obviously in a drunken state. 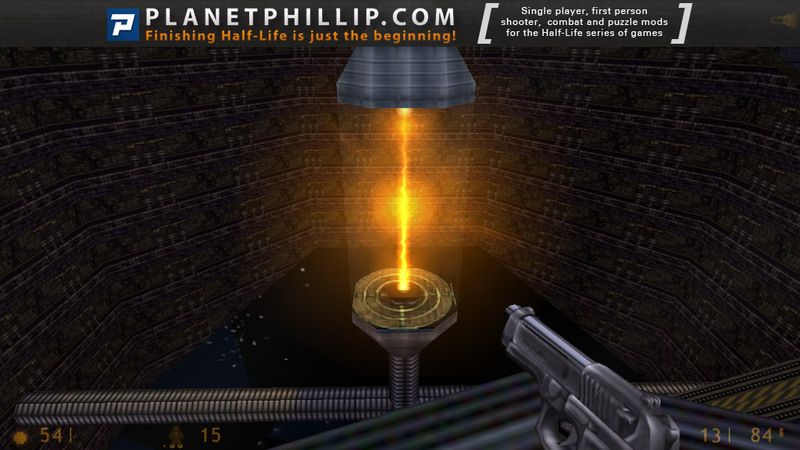 Another section of the level sees Freeman shrunk down to the size of a mouse where you get to explore inside a computer system, and even destroy some of the components. And there’s this brilliant bit where….oh I can’t give too much away, it’ll spoil the surprise. 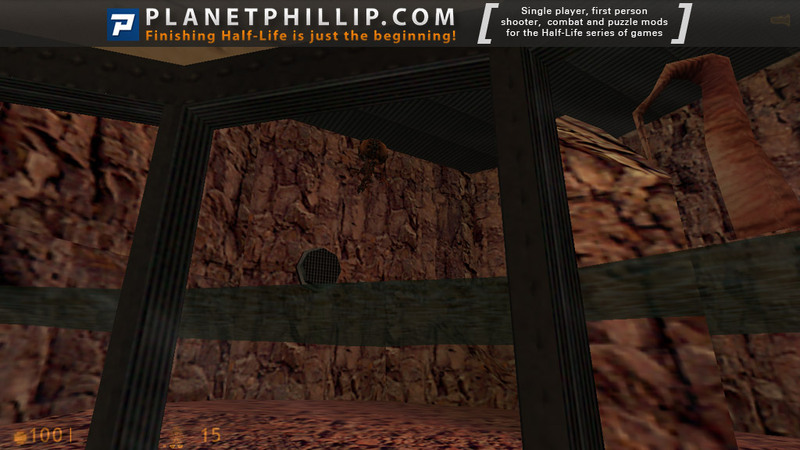 But these few examples serve to demonstrate the level of thought and imagination put into making these levels. So much more than a series of rooms where you get to shoot monsters, more of an interactive storybook. It is difficult to fault these levels, but perhaps where they can be criticised is in their performance. 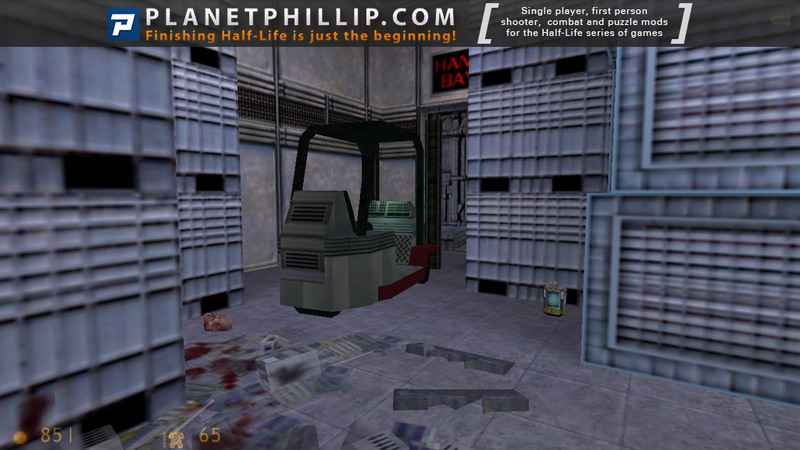 Some parts of the game slow down to a crawl on all but the best machines. Maybe the beta testers were using fast machines and didn’t test the levels for a decent frame rate, so that there is room to optimise the levels, however I noticed a little slow down on my PII450, 128MB, TNT2 Ultra machine running at 800×600, so I can only guess at how it will perform on slower PC’s. 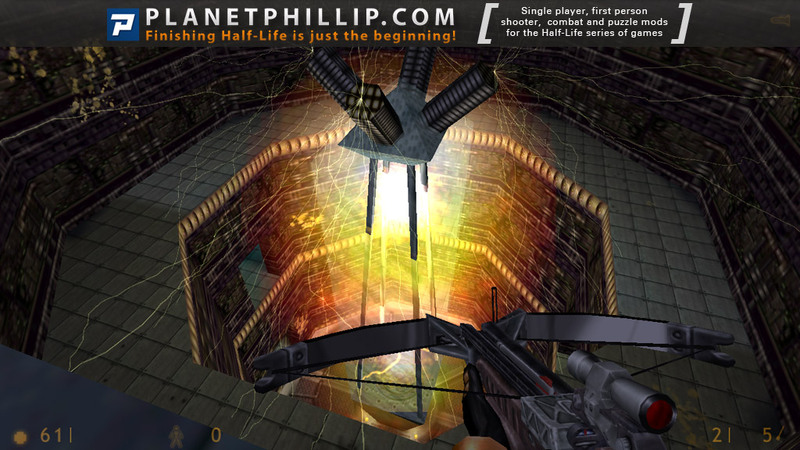 Also DS didn’t contain nearly as many of those scary underpants filling moments that are evident in Valve’s efforts, moments such as monsters suddenly teleporting in from nowhere that would put you into a frenzied panic are mainly absent, I didn’t find myself nervously peering around corners as much as I did in Valve’s levels. But these are pretty much scrape the bottom of the barrel attempts to find faults, the fact that I’m comparing DS with Valve’s levels is an honour in itself. 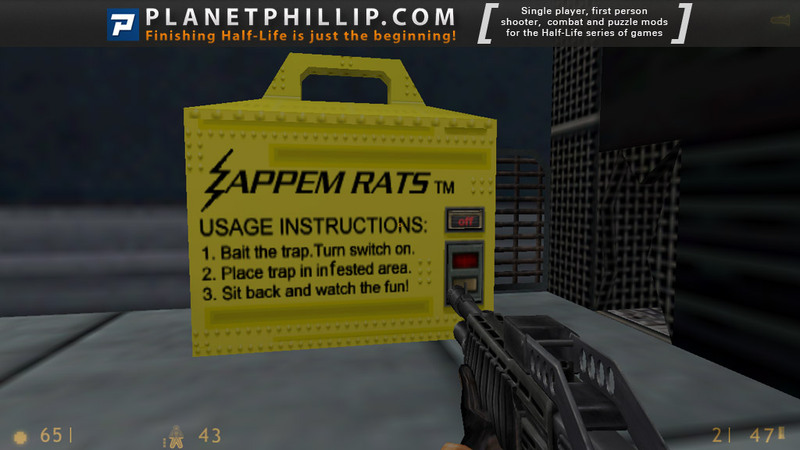 Conclusion -So in answer to the two questions put forward in the introduction, it is just as good as Valve’s levels but doesn’t better them, and this probably wouldn’t make a mission pack on it’s own mainly because it’s not big enough, it certainly has the quality of a mission pack though. 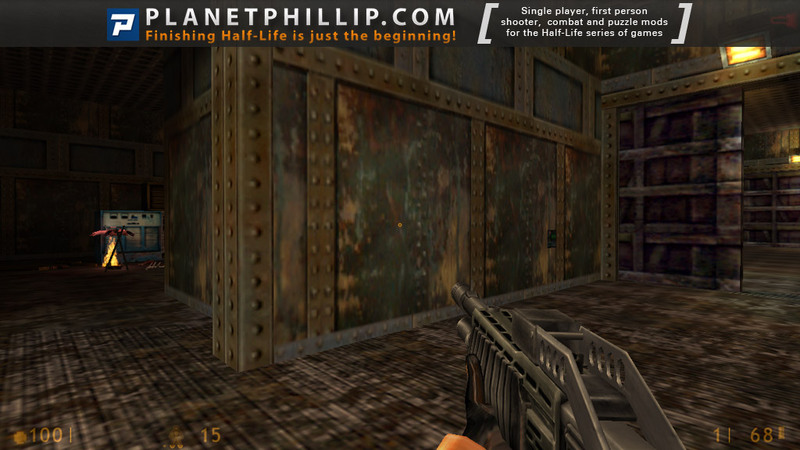 Play this one in the meantime while you wait for Opposing Force instead, it’s definitely worth the download with even the slowest modems. 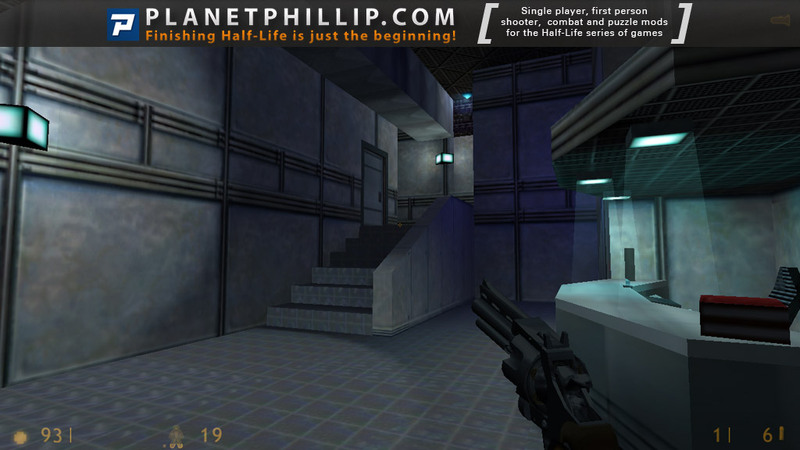 All in all this is the best single player Halflife pack on the internet, for heavens sake Valve, give Manke a job! This review was written by Dominic Pettifer AKA Sunday Ironfoot and first appeared on Iron Planet. 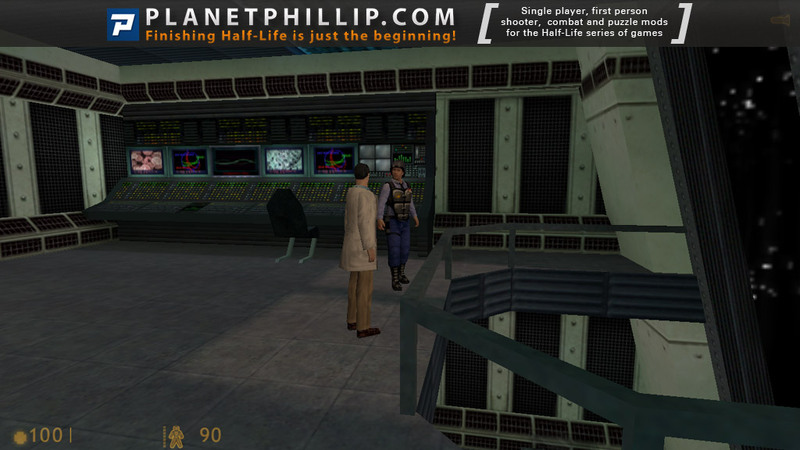 It’s a great mod,it’s only a 10Mb download,and it takes you at least 5 hours on the first try. Great graphics,story and atmosphere.Great mod!!! Oh, and one more thing I forgot, hey Valve,give Manke a job!!! To be honest, I didn’t enjoy it very much. Don’t get me wrong, it is a very well thought out and put together game, but I just never got into it. I guess space settings just aren’t to my liking, but it’s definately worth a shot to those that it might appeal to. Anyway, at the end why does it say “To be continued”? When will USS Darkstar 2 will be released? In my mind, it was thoroughly average in almost every respect… certainly not up to the standard of the developer’s second effort, They Hunger. Seems to freeze under Steam. Any Suggestions anyone? Dave, I apologize for not replying sooner. 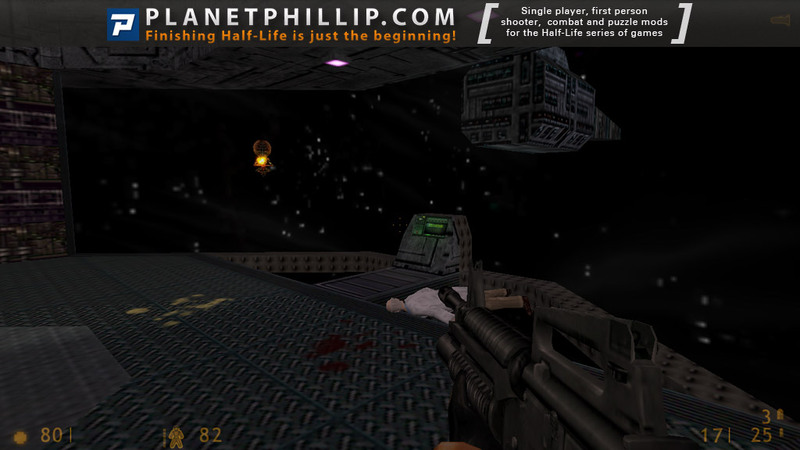 USS Darkstar is a modification for the game Half-Life 1, which is a prerequisite. There are detailed installation instructions in the darkstar.zip file. This is a masterclass in how to make a great mod. 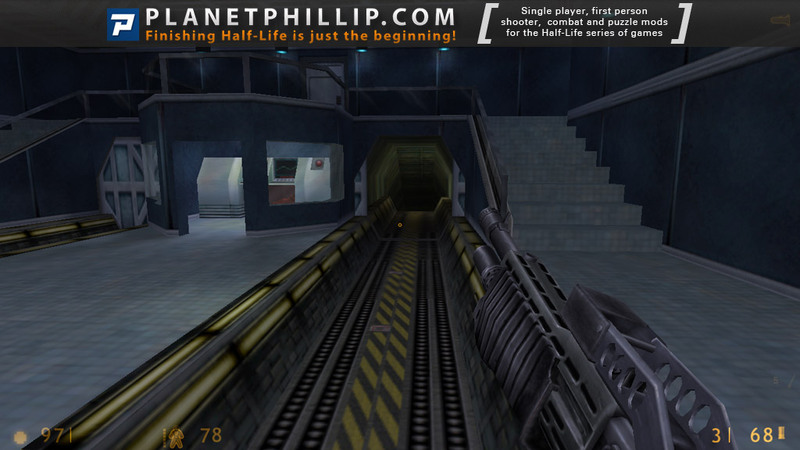 The level design is detail and interesteing,the gameplay is varied and the overall feelin is onbe of professionalism. 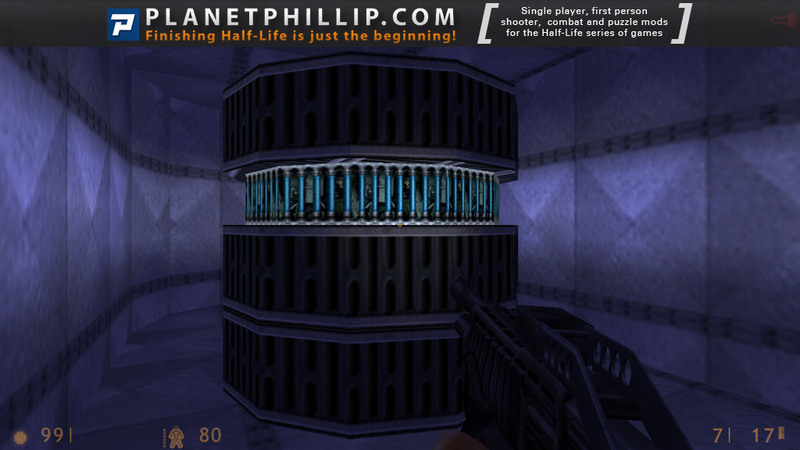 Definitely a Hallf Of Fame mod. 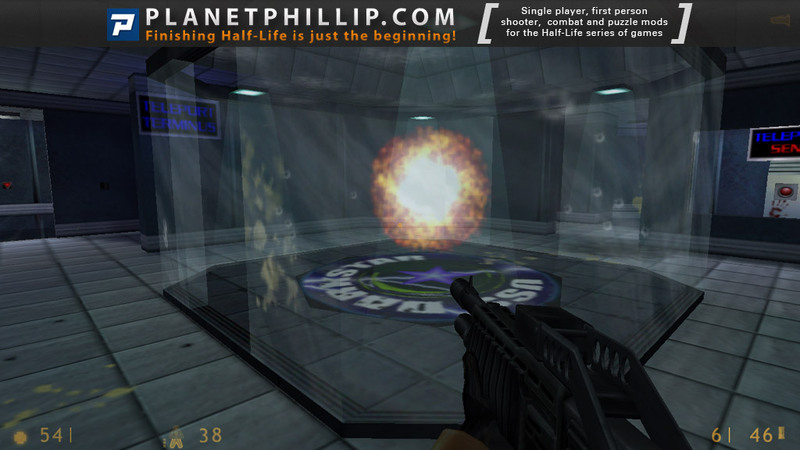 One of my favorite mods for Half-Life. Anyone who hasn’t played it yet should call in sick for the day and just play this, it’s definitely worth it. Instant classic! 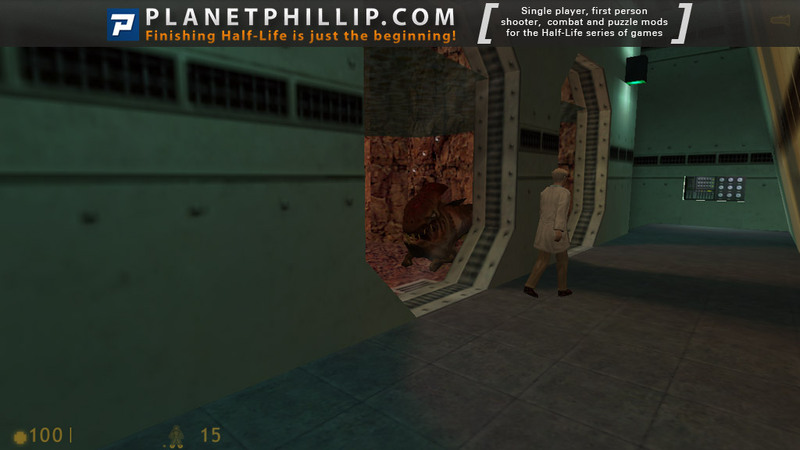 One of the first and best HL mods. 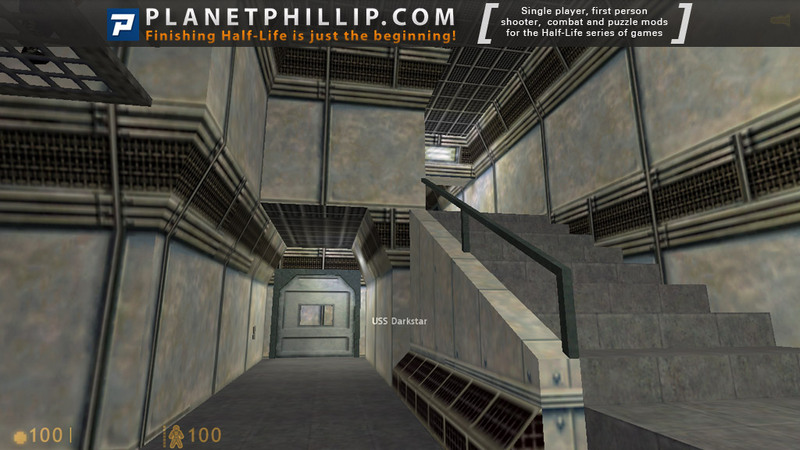 If you like HL1 and have never played USS Darkstar then download now, after all these years and over 400 custom mods later this is still one of the all time greats. Got my copy from PC Gamer 10 years ago. 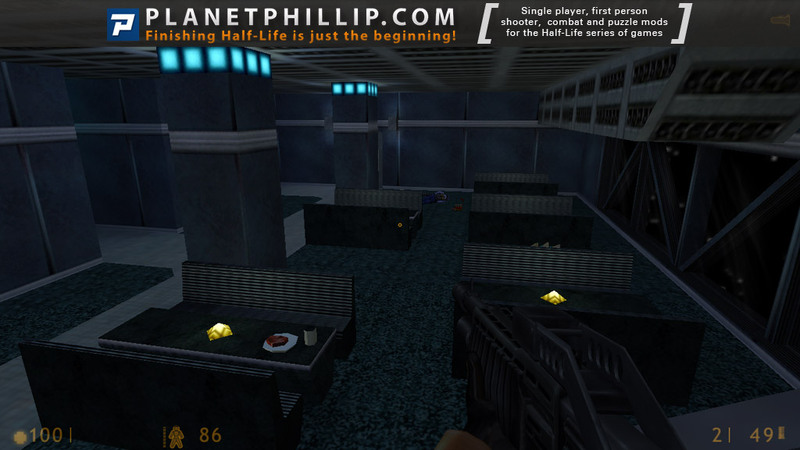 Somebody should convert this to a Source Mod, so that everyone can play it now. They did it with Heart of Evil, and this one is just as good. A real classic! I have got to play this one again. Big Neil Manke fan, ever since Coconut Monkey back in the Quake days. 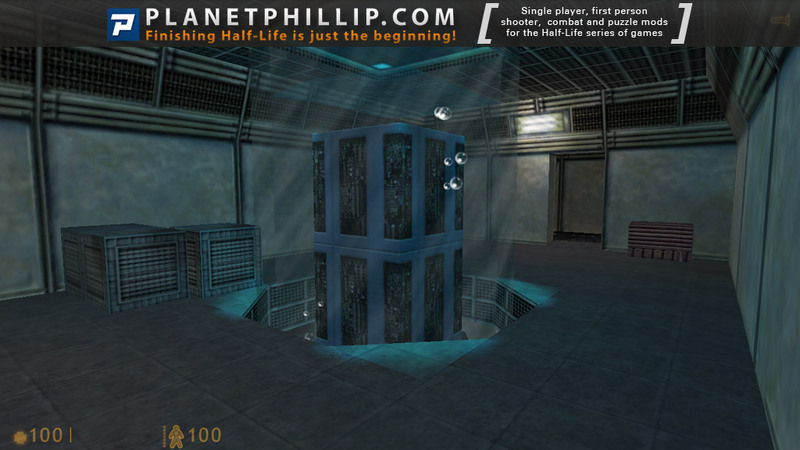 I remember this as one of my favorite mods back in the day and this one may be enough for me to go back a step in the HL world. A fun little mod with an interesting atmosphere. What can I say? I grown up with Neil Manke’s work. One of the first mods I have played, an I have replayed it a few times with great pleasure every time. 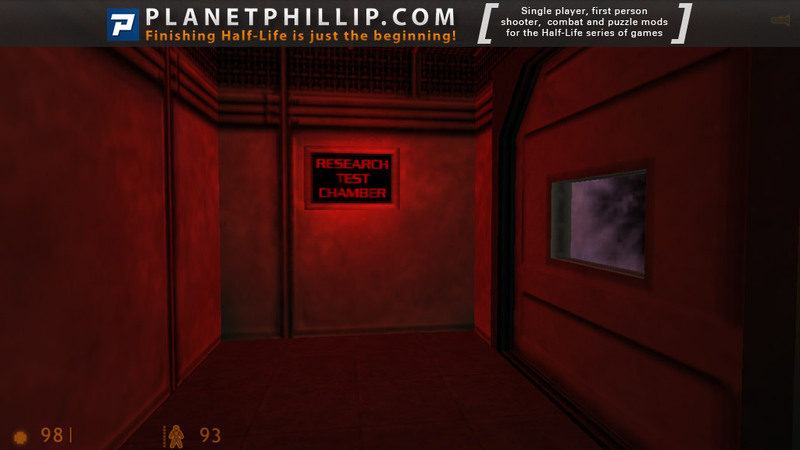 Okay, I’ve already reviewed this, albeit 3 years ago, but no HL nostalgia event should be without this classic. The first third takes you through much of the same areas but does it so well, that it doesn’t feel repetitive. I got confused a few times but most of the time it’s clear where you need to go and what you need to do. I didn’t actual realize that this was released 7 months after the release of the game – that’s incredible! Anyway, on the off chance you haven’t played this, you must. It took me 2 and a half hours to play it, but it seems to have been advertised as needing 7 to 10 hours. Whoo Hoo! At last a Neil Manke. I may not have time to play this (again) for a few days but I will definitively play this again (at least the fourth time) before I post a recommendation. My initial recommendation stills stands. 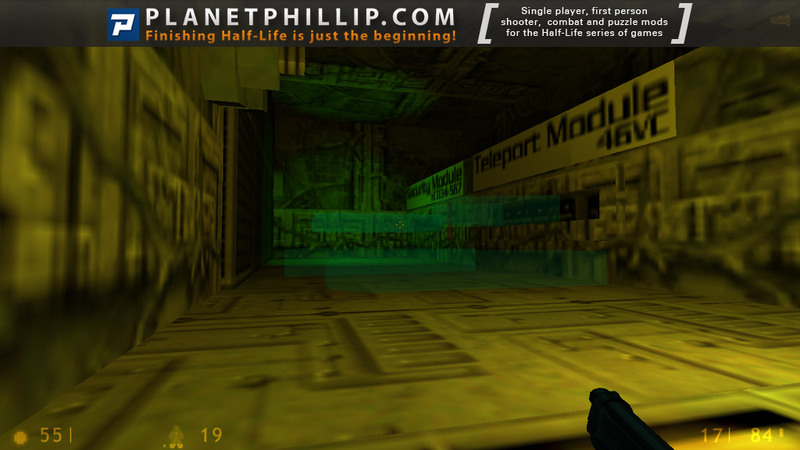 Easily my favorite mod for Half-Life. It’s that good. 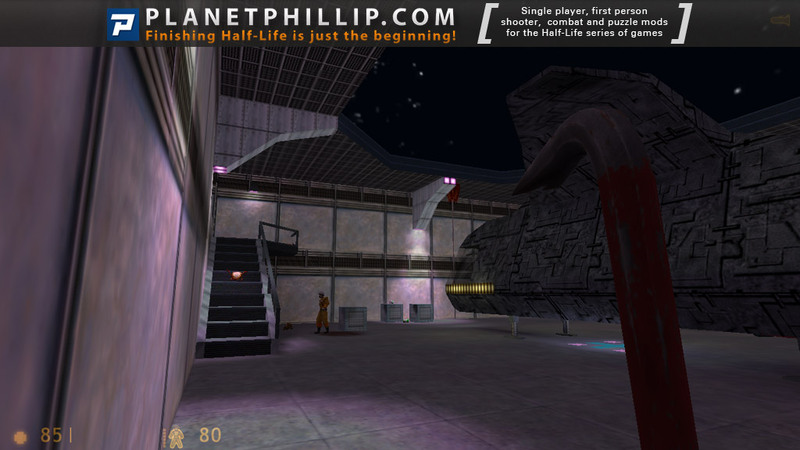 A great mod from one the best HL modders there ever was. I have been hoping for years that “They Hunger: Lost Souls” would be released but it doesn’t look like anything is happening. One question, how do you get to the switch in the room with the mousetrap? I admit I gave up there and noclipped. Welp, finally halfway through the 100 Days I give a score above a 4. USS Darkstar was one of the very first mods I played, and it’s still a really solid and entertaining experience. The design and layout are really well done. 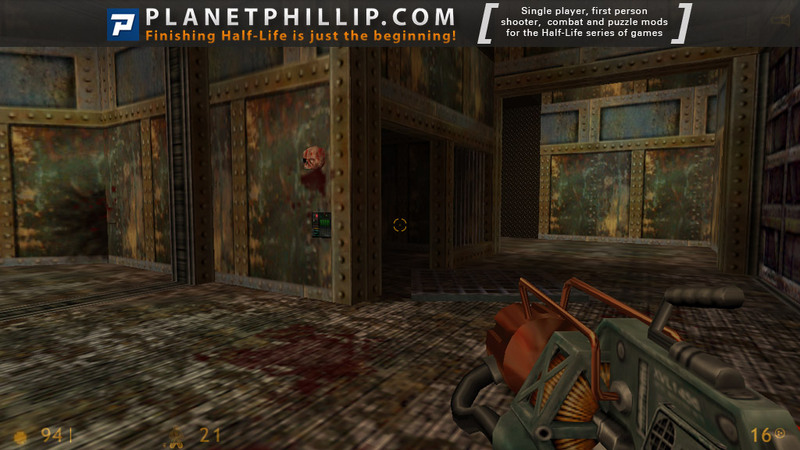 You get a good amount of time to wander the opening area which you’ll see again later after the inevitable accident. It does a superb job throughout of letting you see areas that you’ll be going to, I think this is one of the reasons I like it so much. Another reason is that everything aboard the Darkstar just feels so alive. There are always little scripts or events or just sounds that flesh out the atmosphere and feel perhaps better than any other map that comes to mind. I could nitpick a bit on the voice acting, some bland texturing, and lack of real challenge, but in the end this is just a fun ride. If you haven’t played it you’re missing one of the best ever single player mods. Once again I’m sorry for my poor English, but the site is great and I love to do a review. I will not write a lot, in a nutshell. So, this mod from the famous Neil Manke. Mapping is good, no doubt. But everything else is a fairly average level. What I noted, so it’s low difficulty, but sometimes too high, the gameplay is not interesting. Maud pretty average, in contrast to They Hunger. Like most of the people here, I’ve played this mod before. I loved it then and I still love it now. 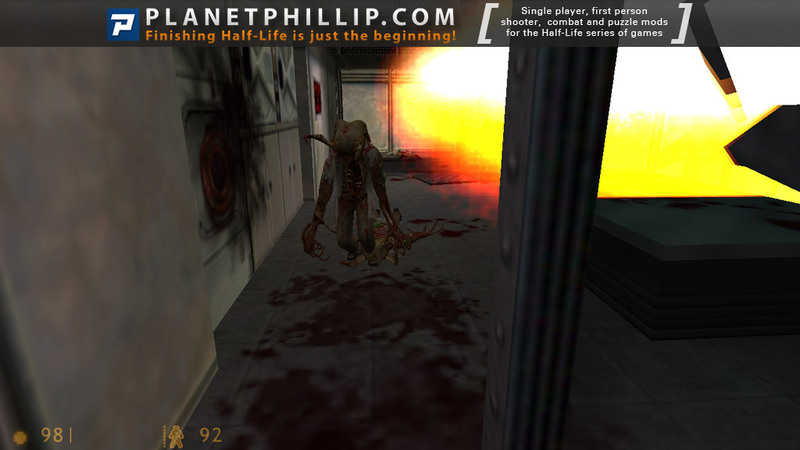 Unlike quite a lot of the maps and mods we’ve had recently this doesn’t have grunts in it, just Xen Aliens, and I much prefer them to the grunts. 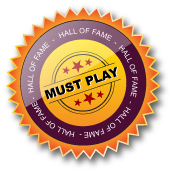 The gameplay was fun with a mix of action and puzzles although nearly all the puzzles are incredibly easy and just result in the player pressing a button to open a door. The action was way too easy in parts which is the only downside to this mod that I can see. The snarks were a little overused too. The voice acting was pretty good in my opinion. I think the voices fitted the characters well. 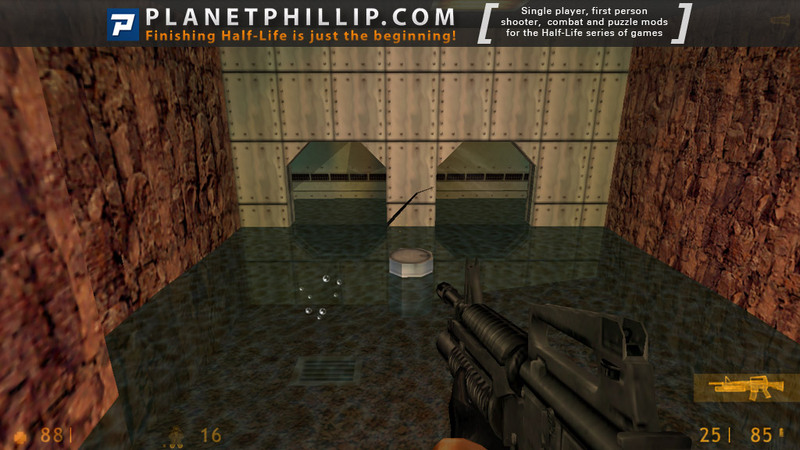 There were also many scripted sequences which were well done and is rare to see in most mods. The textures again were well done and polished off this great mod. 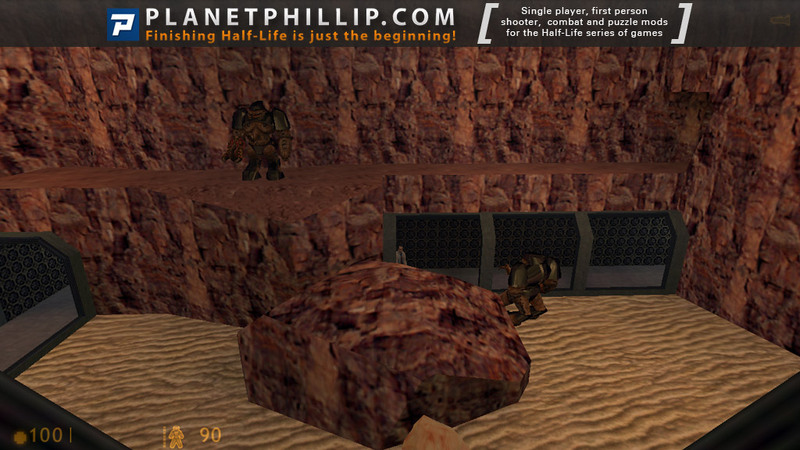 The textures were similar to the style of Radix. Best of the 100SDoN so far and one of my favourite mods of all time. A “Personal Favourite” of mine and a must play. 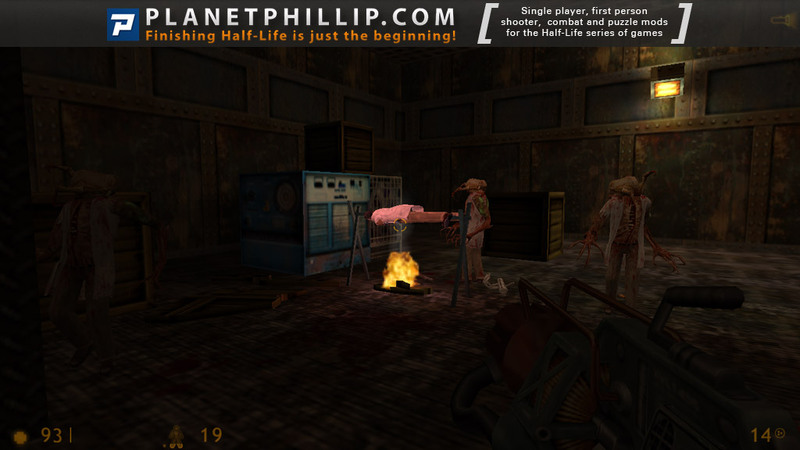 Indeed this must be considered a real classic among the HL mods, because it first showed off what could be done with the HL engine outside the Black Mesa setting. Still I think it is overrated, because the level design itself is rather chaotic and not fitting to the spaceship setting and many of the scripted sequences made little sense with things suddenly happening without reason. But overall a great effort with a cool shrunk section and lots of spaceship feeling! We got to the popular USS Darkstar mod. 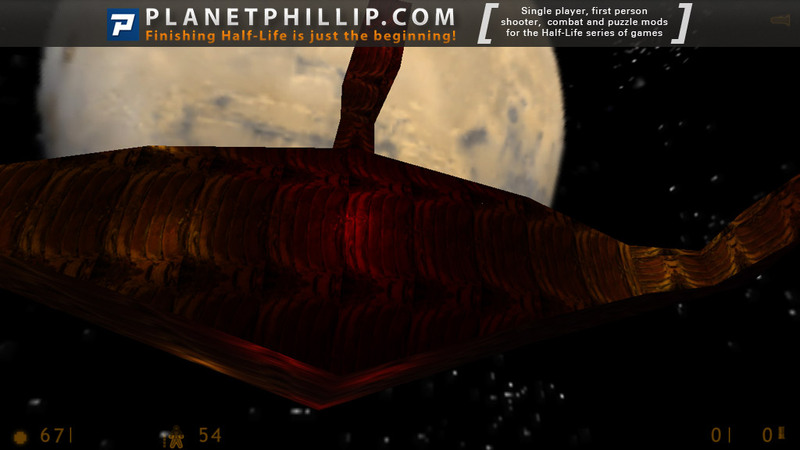 It starts with spectacular cutscene, where camera flies around the spaceship. The atmosphere of the ship is done very well. People rest, read books, try to launch the anticipated hit Gravy Trader. The only flaw is that the lighting is too bright at some points. 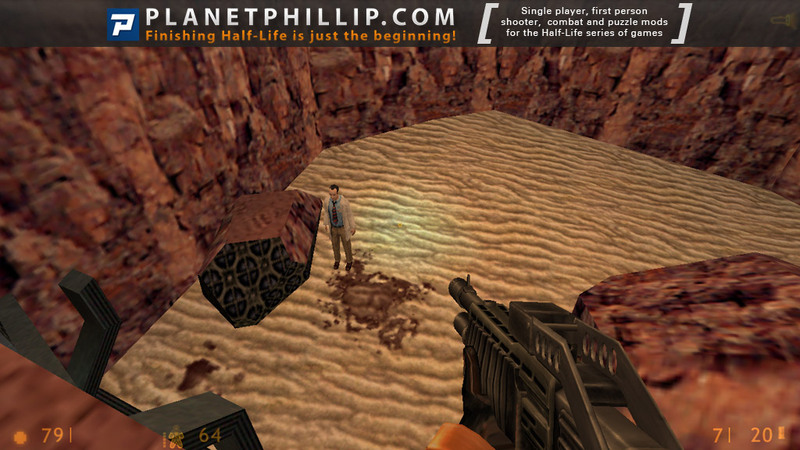 The next levels are similar to the beginning of Half-Life. We enter the zoological labs with interesting exploration. The layouts of individual levels and the layout of the whole ship are very complex, but the design is a mix of good and not so good places. I think it has every location that the spaceship should have, but the design is just not pleasing sometimes. There are some nice scenes with monsters – they use weapons, throw grenades and at some point an Alien Grunt will launch the train at you. 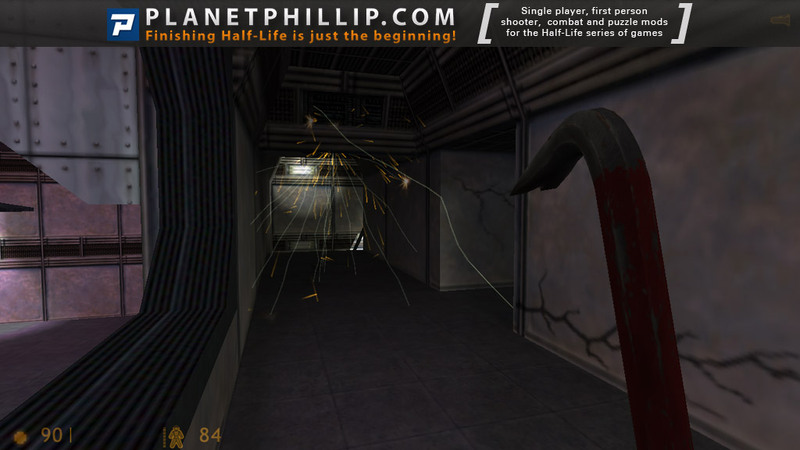 The mod demonstrates very creative use of resources that Half-Life has to offer. Surely it has some very nice original ideas, but for me, the design really drags it down and make it feel average. So, my recommendation is: play it, but don’t expect a masterpiece despite many “Personal Favourite” ratings, because if you do, you might be disappointed. I agree with the comments above, the illogical maze-like level design which wouldn’t work inside a spaceship ever, annoyed me very much too. Therefore my recommentation. Wow! What can I say, it’s still one of my all time favourites even 12 years since its release. I almost certainly got this originally from a PC Gamer cover disc long before I had broadband and I spent a whole night playing and going back to saves to see if I missed anything. That was then, so how does it stand up now? The answer is in my view it’s still a classic. To play this you have to pay attention and explore, run and gun just doesn’t work. Rather than gush on about how great this is (and it is a great piece of work (sorry! Gush, Gush)), USS Darkstar is a classic example of the need for testing. This was a commission piece for PC Gamer so almost certainly was paid for and as such would have been thoroughly tested before release. The result is a reasonably well polished mod which we didn’t have to pay for (except the cost of a magazine all those years ago), and boy ” O” boy for a freebie its a good’un. Looking at the release dates here on PlanetPhillip this came out a month after Rogat which judging by its awfulness was probably not tested at all prior to release, the difference shows. 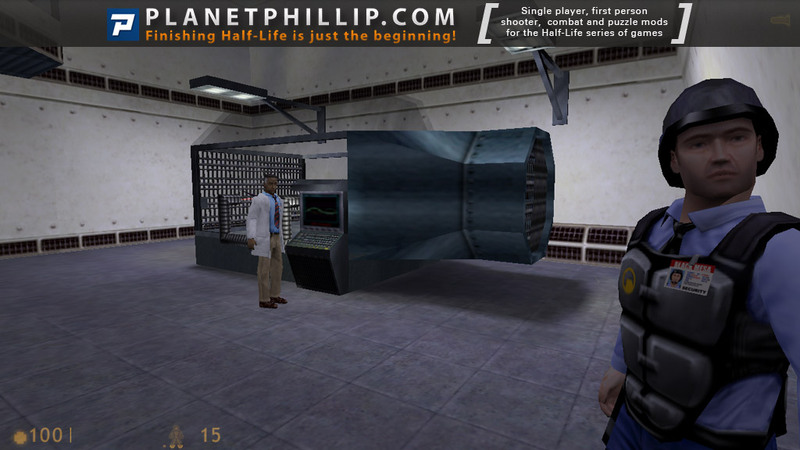 We need also to remember this was made not only by Neil Manke, but a team from a a professional company, that however doesn’t affect my rating as this is the first mod in the 100 that really does bring a wave of nostalgia. 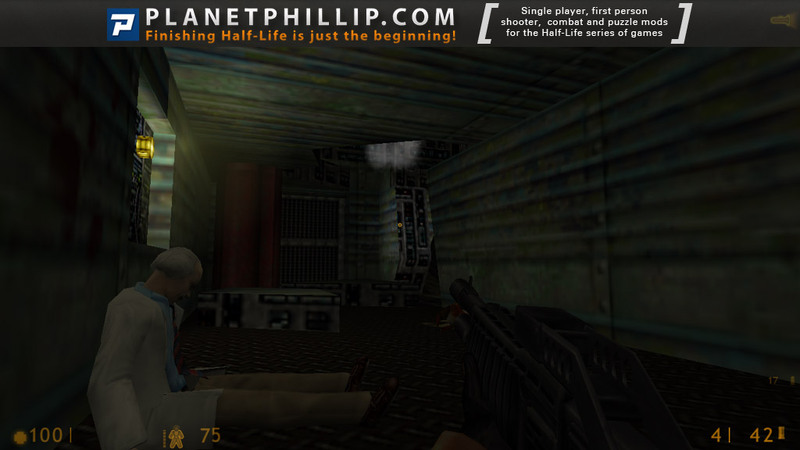 The gameplay, the look, the feel all add up to a game that is genuinely fun to play, if you are even only slightly into the Half Life universe, you must play this. My only criticism is there’s not the part 2 mentioned at the end of the game. 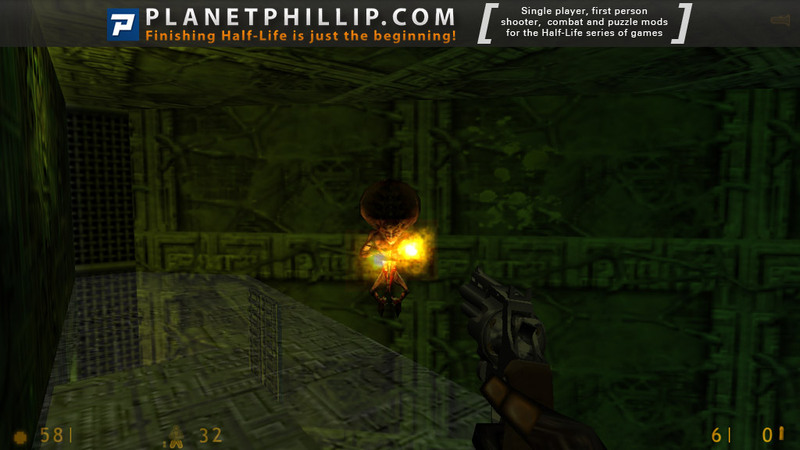 This will be the only other mod I’ve given a PF to so far on PP. I finally managed to get past the frustration of the first level of this mod. I’ll say that it’s worth playing, certainly, though it would never rank in my top ten for any reason. The beginning moments are remarkably boring, difficult to figure out what is to be done, and while there is a good amount of humor within the dialog, it’s also just a little weird. I’m guessing that there was some kind of context to the “damn that monkey” thing, but I’ve got no clue beyond the in-game “game’, was that a real game? Did the developer work on it or something? After putting the mod aside for a day, I went back and finally started exploring more fully. I will say that I had to resort to a LOT of noclipping in places, in order to find a way through a place that had no obvious OR hidden paths. When I have to do that, any mod is going to lose a little luster. This happened on numerous levels. The added dialog was all right, though I think I missed most of it, since there was no indication by new skins or triggers to click on anyone in any given area. Because of that, I wound up running around frustrated numerous times. I dunno, I see why some folks liked it, but it’s not my favorite thing, and I’d say if you’re easily led astray or confused by multiple-pass travels across the same map, this mod’s going to frustrate the hell out of you. 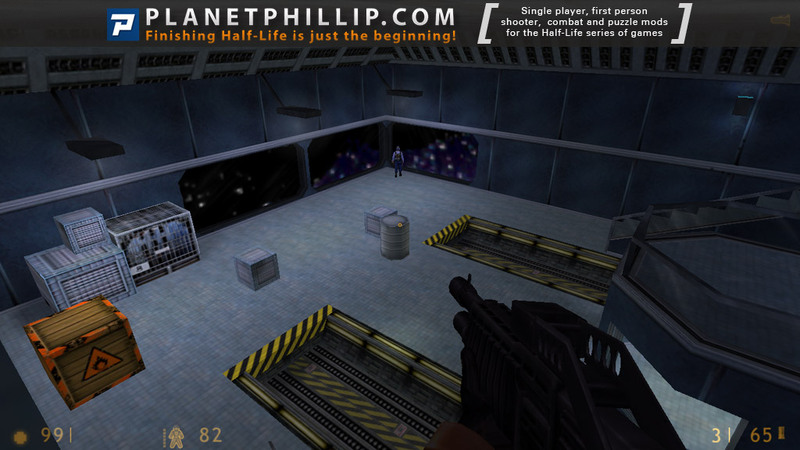 Aclassic as Phillip said, and now that I replayed it I know why it is a master piece in the HL1 mod universe, I really don’t know if PC Gamer Magazine, has help this mod project to bacame a classic, but I think that USSDarkstar, had a few impulse thatn the They Hunger mod project which also launch PC Gamer, and was a really marketing modding hit, that maybe actually helped HL modding universe a lot in order to be a stronger community. Anyway here we have great mapping layout in which every mm. 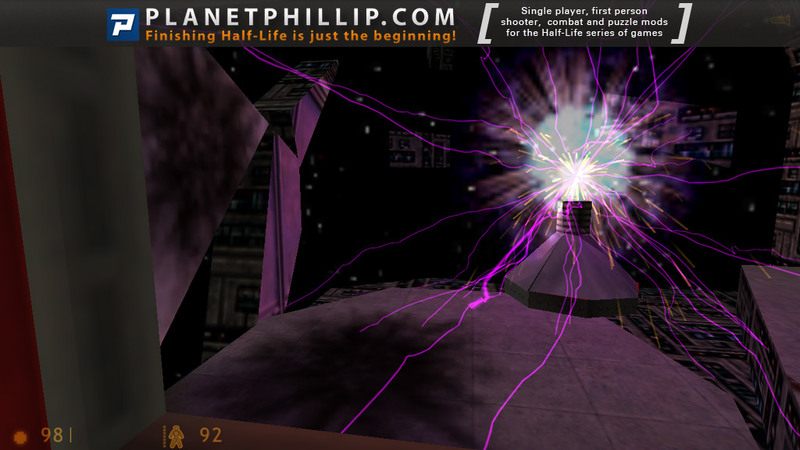 or inch of the map is well used and the player allways will find really cool battles and is so cool that the spaceship enviroment holds and sourround every detail in this mod, also just to be launched few months after the Hl is a great triunph for the guys who developed this mod. 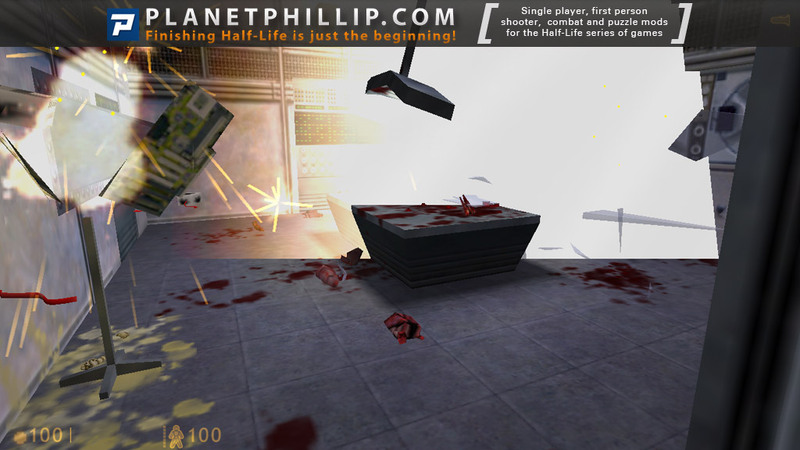 The part were ur size is reduced was brilliant and inmediatley rmember the well aclaimed “minimicus” mod, also the part where u get into that computer, is so cool and maybe inspired other cool mods like “Ghost in the machine” for HL2 but I don’t know for sure, but here we see many cool ideas then exploided by further moders. 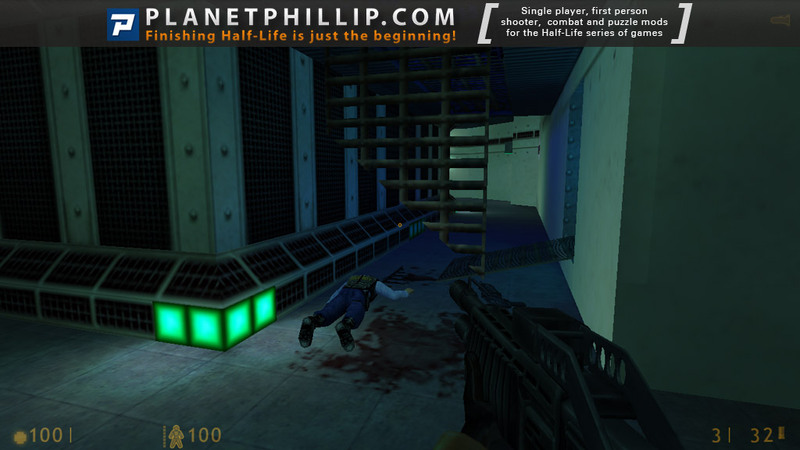 When I first played this mod arround 2007, to me was just another old hl mod, but now it’s sure that is a classic thing, and is a good example of what a good mod should be, I mean really dynamic in the gameplay fluid scenarios and cool battles, and also with no nedding grunts!!!. only xenian guys trying to stop you, I mean, having only xennian ennemys could be a hindrance for some mods projects, but here was clear that it also could be an advantage in what making a solid environment respects. The only issues with this mod were that maybe the beggining could be a little bit hectic due to the many paths the map contains and u have to remember whern the mess comes out, I forgot to pick up [spoiler]the gauss cannon located in one scienitsists lab, so don’t forget to pick it up! [/spoiler] and also the other issue I had was with the security card just before acces the bridge, I have to say I didn’t found it in any part! 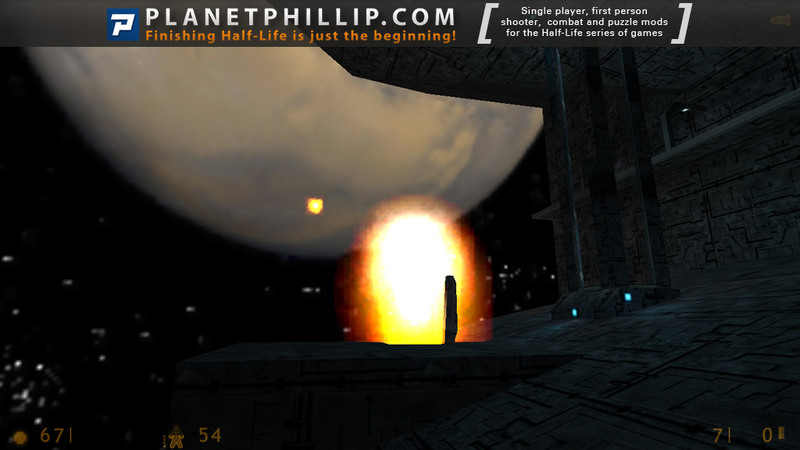 !, so I had to proceed with noclip to the bridge of the darkstar, appart from those dettails I think this mod is cool and fun, is a classic that u have to play, and I hope the guys develop the continuing story or the 2nd part, which I know is unlikley but , at least they should try for the old nostalgia times! Another PF, let the accolades pile up, they are certainly deserved! 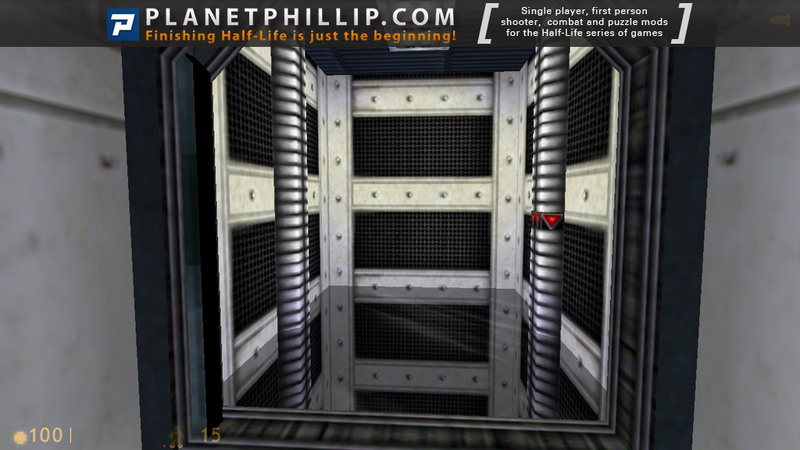 One of the classic’s.The level design is just excellent and the combat is solid throughout.It had a lot of cool moments,such as being shrunk down and having to go in a computer.This mod really showed what could be done with the HL engine when it was released back then.Now the mod did have a lot of snarks coming out of vents moments but it doesn’t take away from this awesome mod.Download it now if you haven’t! 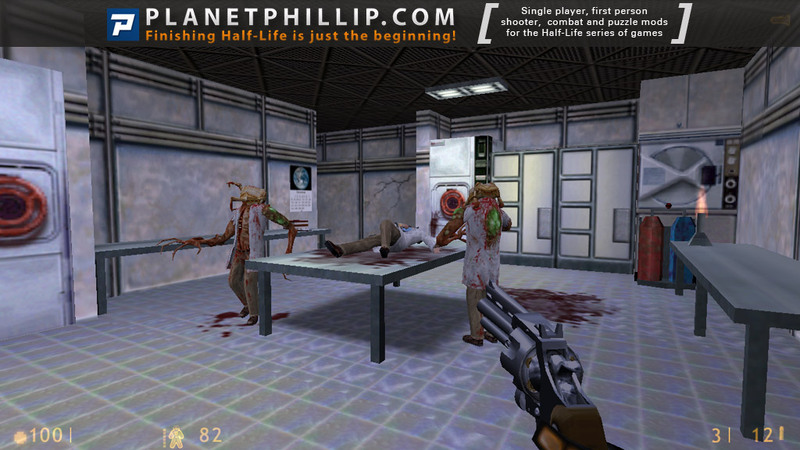 One of the classic mods, oldie but goldie, worth playing if you haven’t yet! 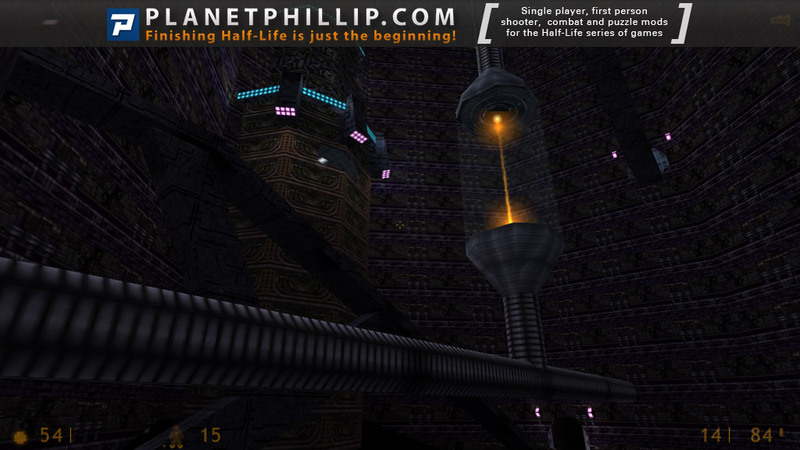 Maybe the setting on a spaceship is weird for HL players, but the level design, puzzles, graphics are very good! It’s been established almost beyond question that Neil is the best amateur mapper around and this latest release has generated almost as much hype – and probably as many delays – as a lot of games. 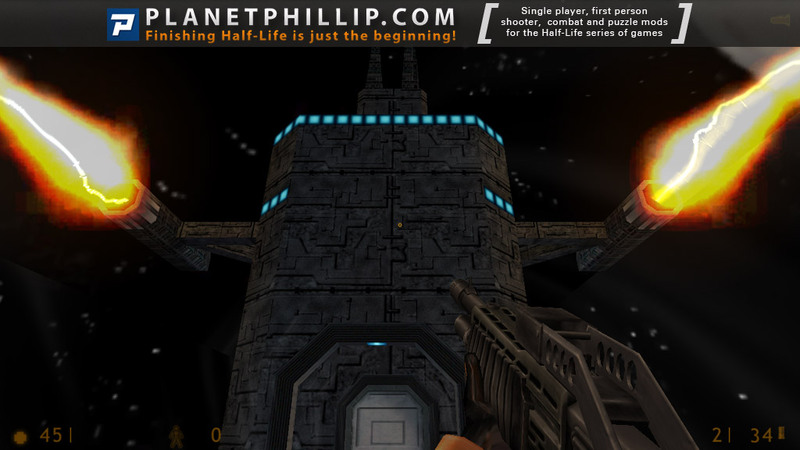 USS Darkstar has a hell of a lot to live up to, both in terms of expectations and of those Quake and Quake II units that have gone before it, and Neil also had to overcome the challenges of working with a new game engine. With these things in mind, I prepared myself for perhaps some disappointment as I loaded it up. Approximately three seconds later, I realised I needn’t have bothered. 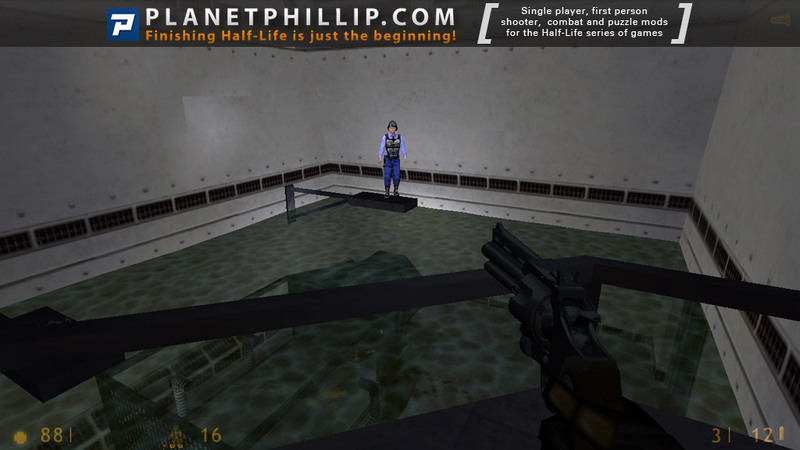 The introduction to this unit is astounding – it’s not just content to be far above anything you’ll have seen in a user map but is almost as impressive as the start to Half-Life itself, albeit in a very different way. From the very instant it began, it was obvious that any doubts about Neil’s ability to maintain his previous standards in this new setting had been unfounded. 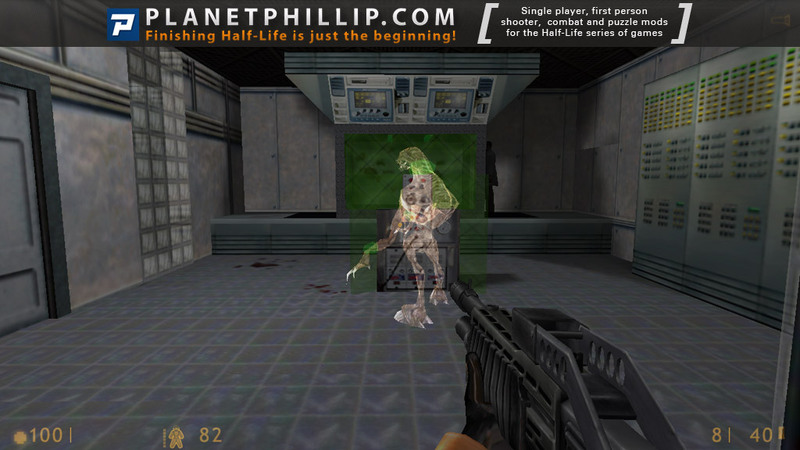 What also soon becomes evident is that he’s adapted his style, and not just his skills, for Half-Life’s demands. 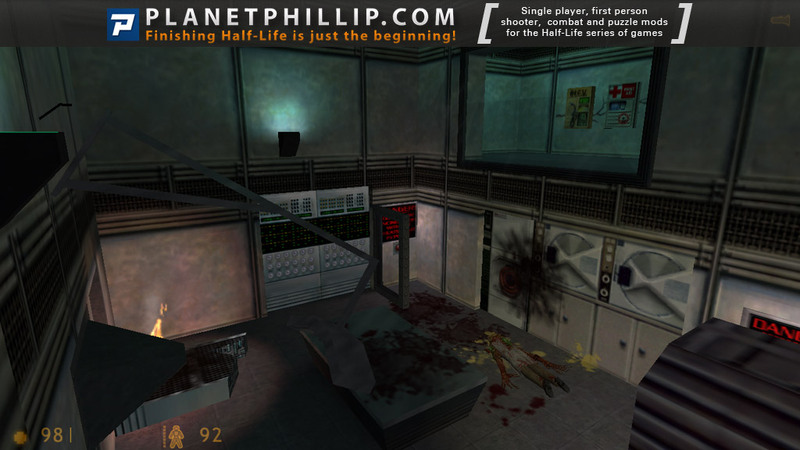 Ever since Valve came along and raised the bar a few notches, it hasn’t really been enough to release a straightforward action-oriented Half-Life level. 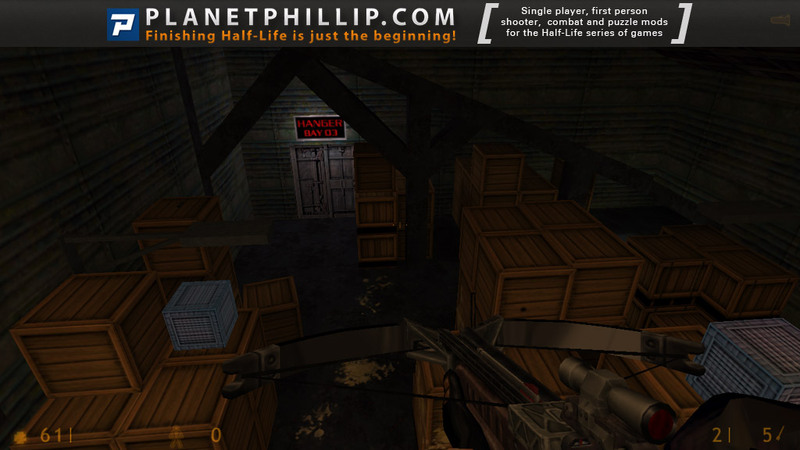 Just as in the full game, the build-up here is slow and deliberate, setting the scene for the chaos to come, and you’ll be waiting a while before you even get your first weapon. 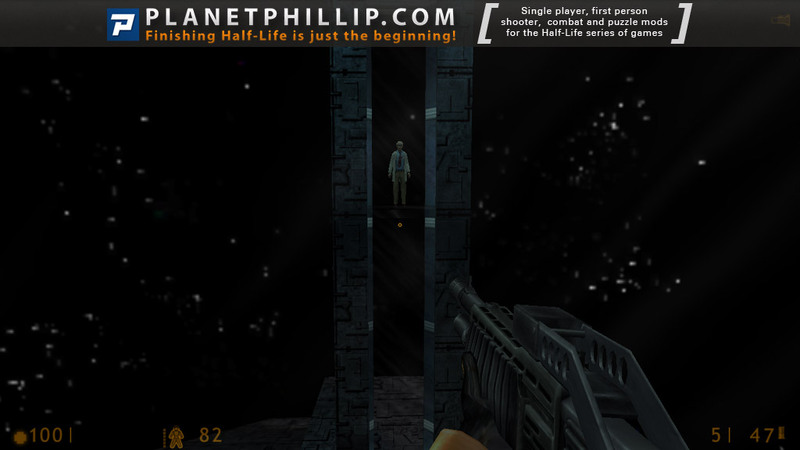 Throughout the first few levels, you know exactly what’s coming but it doesn’t matter; just like a good horror film, even though the outcome is inevitable, the path to get there is so well-crafted that the tension just keeps building anyway. It may just be another map but there’s a hell of an atmosphere in USS Darkstar. 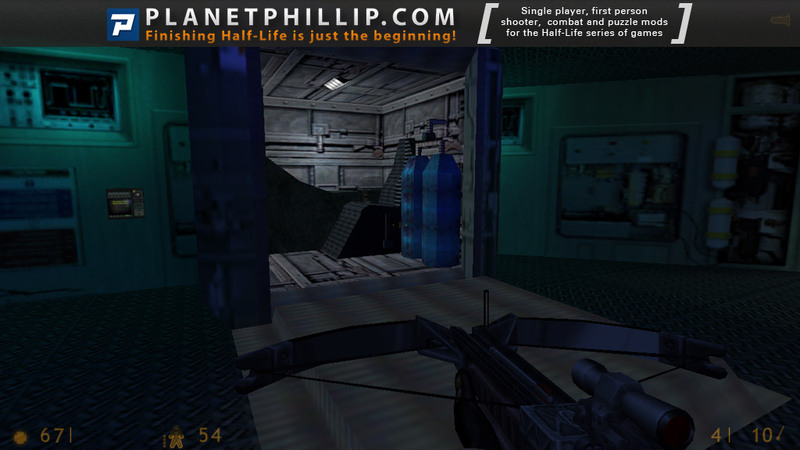 The gameplay is much more about exploration than any of his prior work and does a perfect job of imitating all of the good – ie. 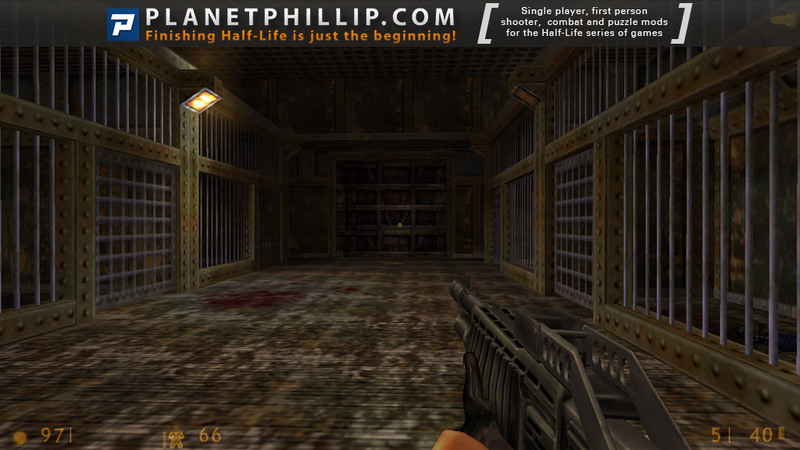 early – parts of Half-Life. There is plenty of battles to be fought as you play through but that’s not the focus, probably best illustrated by the fact that you won’t even find any grunts in USS Darkstar. This is about creating a gripping and immersive environment, one that is believable despite the setting, and it couldn’t be more successful in that respect. As always, it’s very difficult to find any areas worthy of criticism. 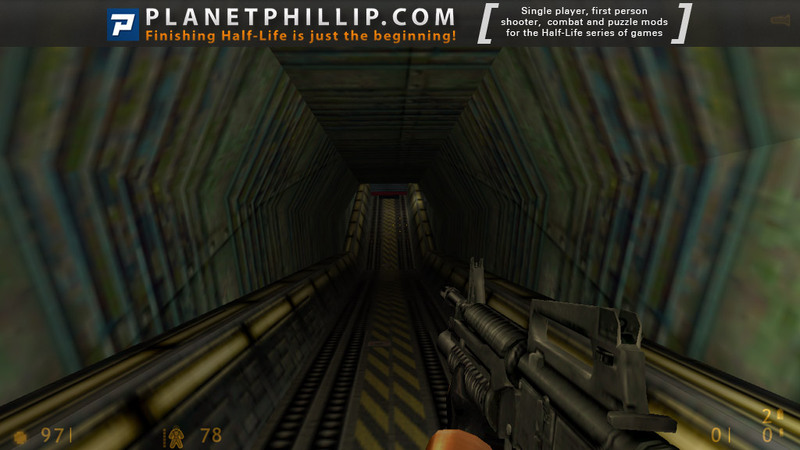 If this was a Quake II level, I’d probably have a few things to mention – the fairly low-key combat, perhaps, or the fact that a fair degree of exploration is required in some places to find the route onwards – but in this context that would be somewhat unfair. 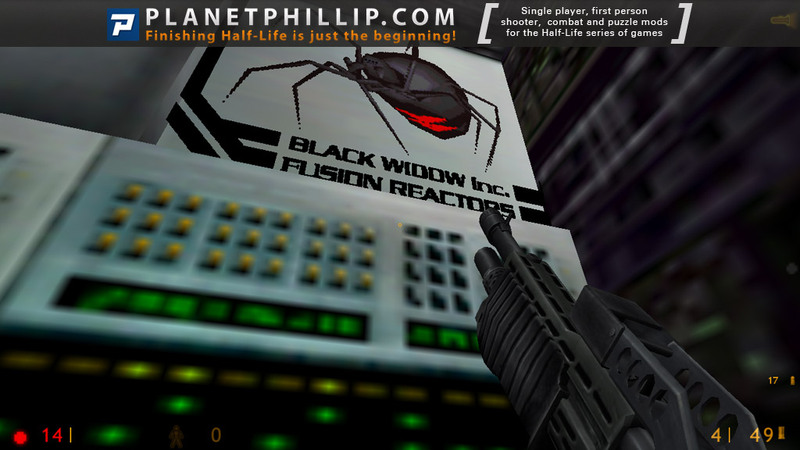 Anyone downloading this will have played and presumably enjoyed Half-Life and this unit continues very much in the same vein. There’s absolutely nothing significantly wrong here though. Even if there was, it couldn’t possibly warrant skipping this release for the simple fact that USS Darkstar contains what can only be described as The Single Best Moment In A Level EverTM, and I say that without exaggerating in the slightest. I reached a particular point in the level and thought, “this is the single best moment in a level ever.” I can’t possibly say anymore because I’d hate to spoil it for anyone but rest assured that when you reach it, you’ll know it. I’ve seen similar ideas before but the way it’s done here will never be bettered. Even without that highlight, this is totally unmissable. 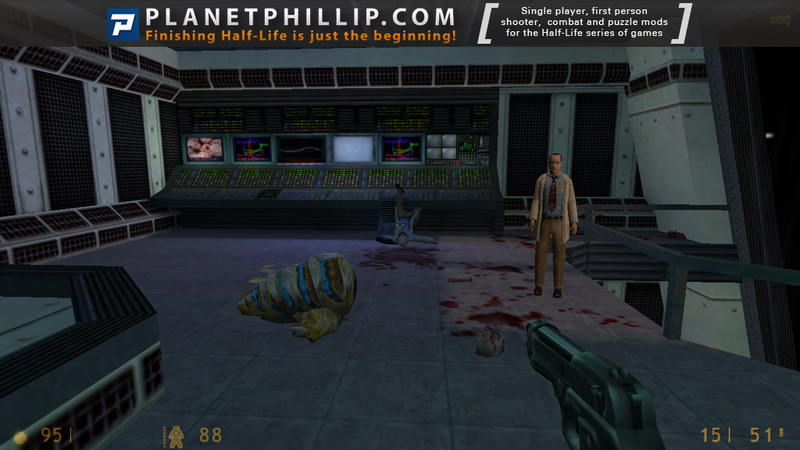 Though the setting is pretty different, I think it’s fair to say that Neil has managed to beat Valve at their own game with this latest masterpiece. The fact that the quality of the levels remains so high through every single one of its seventeen levels is made all the more remarkable by the fact this was essentially created by a single person. I don’t think I’m doing much more than stating the obvious when I say that the only mapper that’s going to better USS Darkstar is Neil when he finishes its sequel. This review is republished here by permission and was originally published Monday, 14th June, 1999 by Morgan. What would you think I would rate this. It’s USS Darkstar. 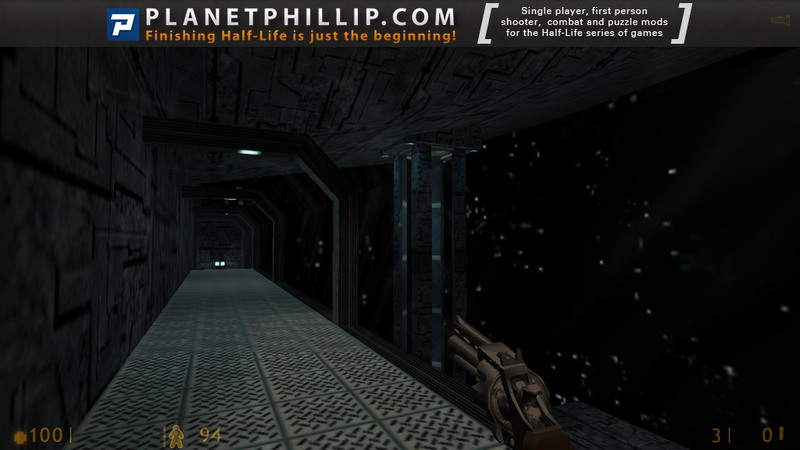 The mod is as classic as it gets, for getting released 7 months after the original game (thanks Phillip). 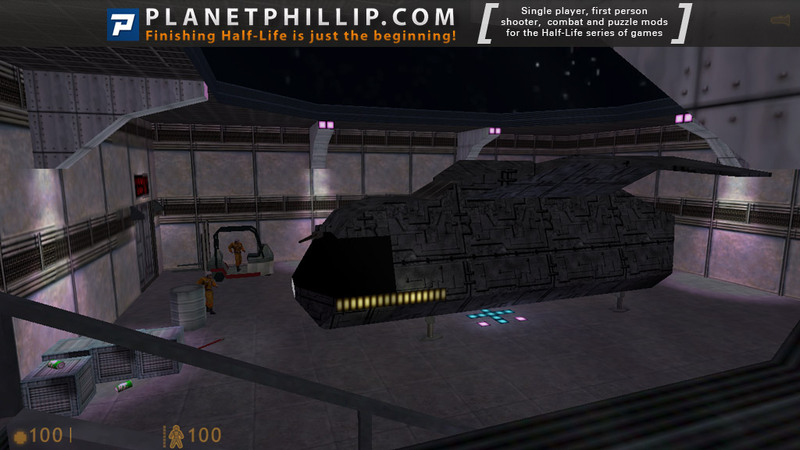 The setting is very original if you compare it to other mods; it takes place in a spaceship. Though, everything gets ****ed up and you have to escape. Every area is incredibly detailed, it never gets old and, I think this NEEDS a sequel. PLAY THIS RIGHT NOW YOU WON’T REGRET IT. WOW! 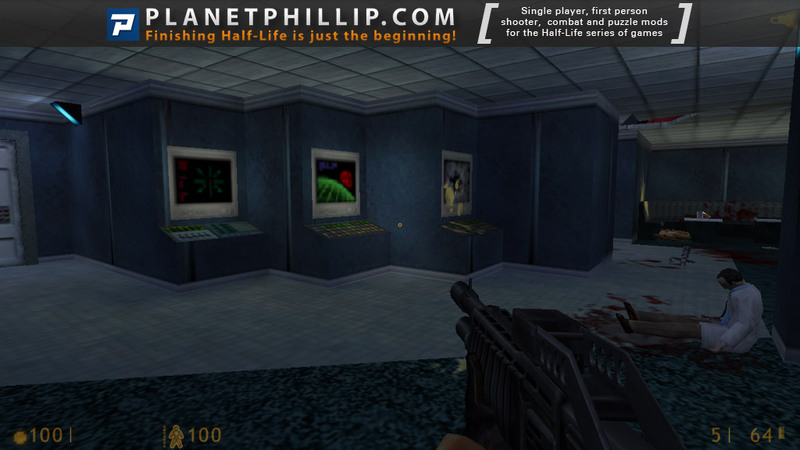 Just finished playing this and it is without a doubt one of the very best HL mods I have ever played. Right up their with ETC, Deliverance et al. 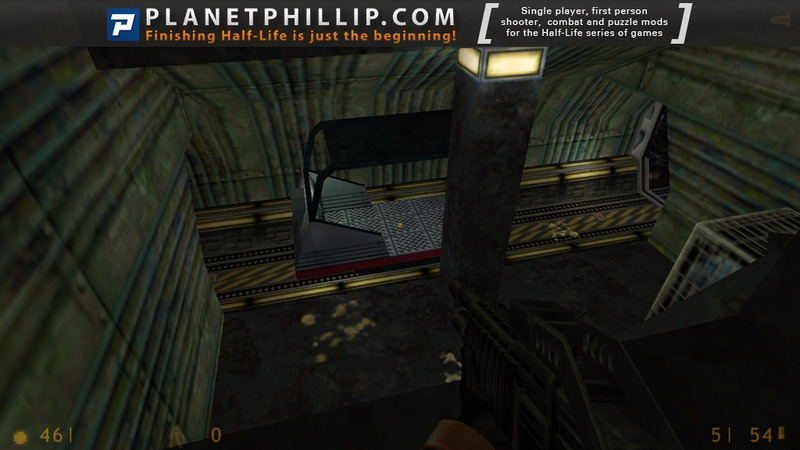 Now I’m not normally a great fan of half life mods, after all we are now in 2016 and games are much smoother and less clunky. 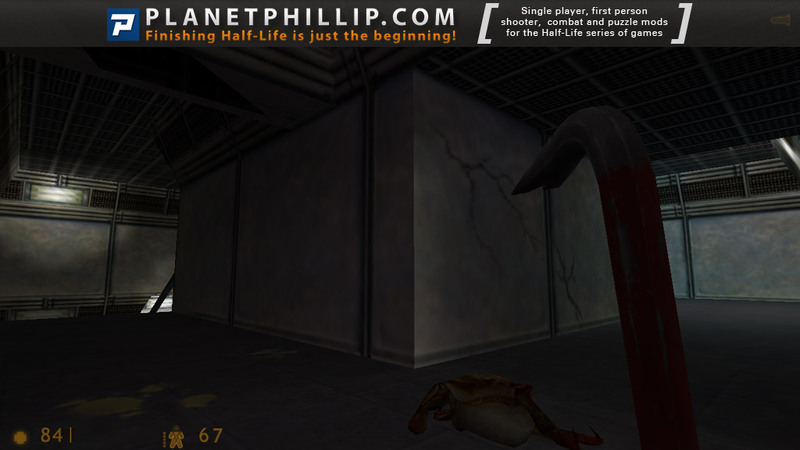 The original half life, though undoubtedly great in its time, does take some getting used to after playing HL2 and its Episodes. 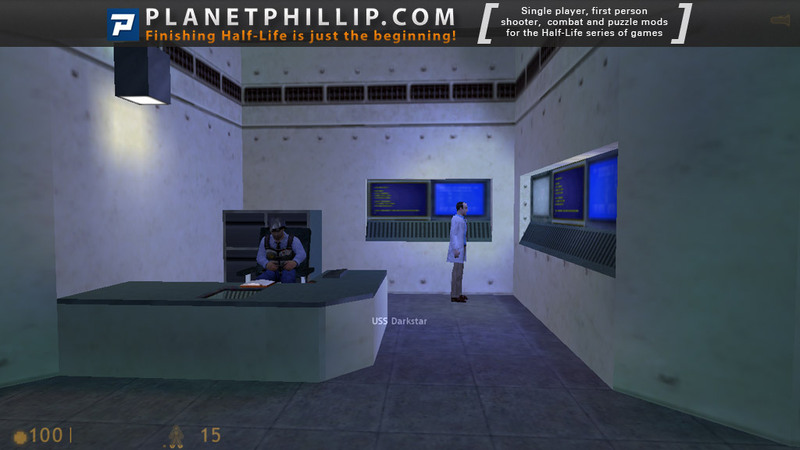 Obviously Black Mesa has changed all of that but these mods are for the original version. That said this was just great and I found myself completely immersed right from the start although it did take a while to get properly going. I would urge anyone who has not played this before to download it now. Your recommendation image was removed. Recommendations are only allowed when posted by someone who has completed the mod and posted a proper review or set of comments on the experience. Although I agree with everything Morgan said, this is just too amazing a level for me to not offer any further insight into it. I do have some minor issues with the level. 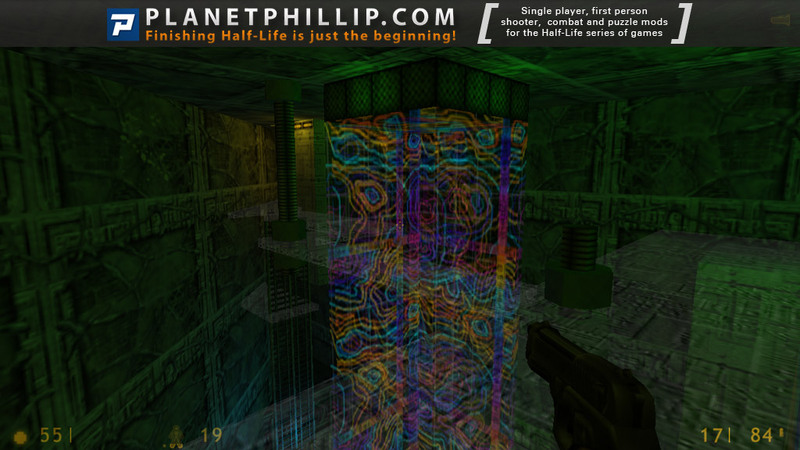 Mostly it was the fact that Neil really went nuts with the puzzles in this map, more so than earlier releases and I wouldn’t be surprised if the hit counter on his walk-through at his site really builds 🙂 A little less mental anguish with this map probably wouldn’t have hurt, but then people who liked that kind of stuff probably wouldn’t be as happy 🙂 It’s almost irrelevant to this release, however. 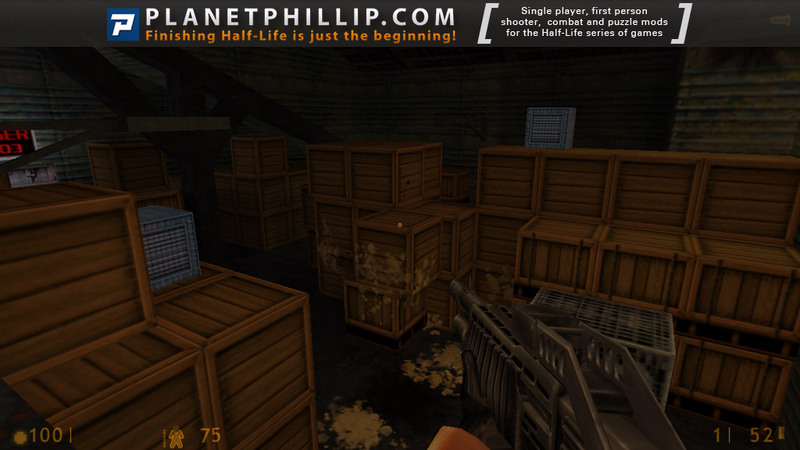 With most maps, getting confused and lost leads to frustration, with Neil’s releases, it just adds to the addiction. The fact that you don’t get to fight marines is something I can’t ignore. Despite the great action setups Neil used, there was never a climatic moment. After that testicle monster (I know, I know, it’s a Gonarch, but it looks like a giant testicle 🙂 scared the crap out of me, there wasn’t another truly memorable fight. It’s hard to have one with just aliens, but I felt a gargantua or another testi… er, Gonarch blocking your end path would’ve been much more exciting. One part of the “Holy Trinity” of HL mod’s (with They Hunger and Absolute Redemption). 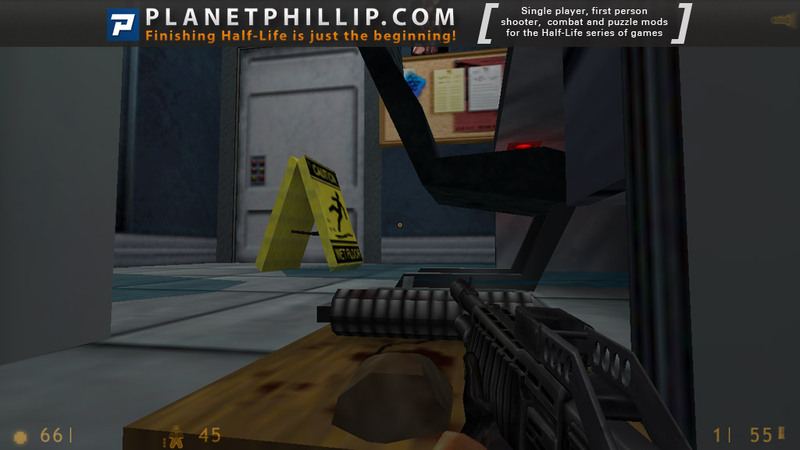 It is from the same developer of They Hunger, if you know it. USS Darkstar doesn’t have really any flaws : not too short/not too long, no impossible fights, some challenges here and then, diversity in sequences… Well, that’s it. Does anyone know if Neil Manke is still even alive? Some info on a very famous modder would be greatly appreciated. 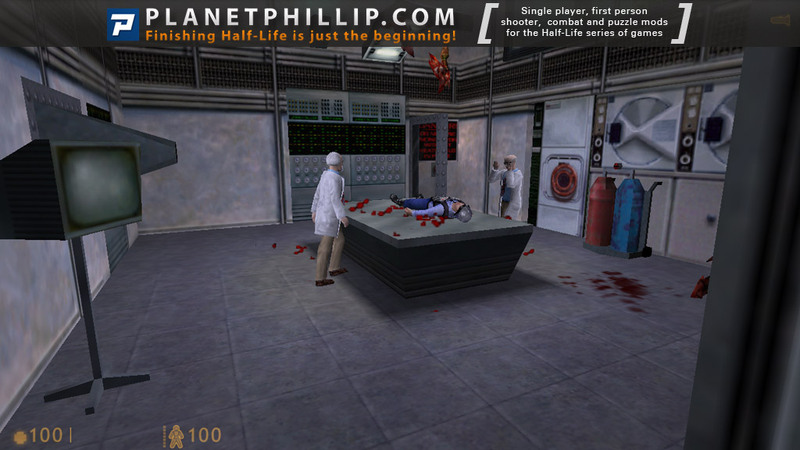 I don’t think he’s dead, but it’s been a long-standing mystery in the modding community. It is driving me absolutely crazy not to have found it, but I swear within the past couple of years I stumbled over a claim, maybe in a Reddit thread if I’m remembering the site’s color scheme correctly, that someone had gotten in touch with him. For the longest time there was the rumor he’d died; that’s everyone’s go to assumption when someone goes silent, as if there could be no other reason a person would step away from the swirling, chaotic, waking nightmare we call the internet. Over the years following the first appearance of that rumor, dox would occasionally pop up connecting an address and phone number to his name. People would propose calling, but no one ever went through with it. Then someone claimed they had worked up the nerve and actually done it. I can’t say I’m comfortable with pestering people out of the blue like that, but I was happy to hear some sort of update. As the story goes, they called the number, Mr. Manke answered, the two talked for a few minutes, and that was it. I remember the specific detail that when the caller asked to confirm the man’s identity, Neil corrected his pronunciation of his surname. “Mankey” as opposed to “Mahnk-uh”, or something along those lines. I’m not sure. I also remember the conversation purportedly ended with the caller thanking Neil on behalf of the community for the maps and mods he’d made, and promising not to bother him with further calls, passing along to the community the request to respect the guy’s privacy. As I recall, the impression was that he’s not in terribly ill health anymore, if he was in the first place, and he simply got out of modding due to lack of interest? But that’s fuzzy. And, of course, it’s all up for debate, as I can’t find the damn page now to back up a single thing I’ve said. I haven’t bookmarked it, saved a local copy, or even grabbed a screenshot. I can’t remember where it was, either, to check the Wayback Machine. I imagine a plausible reason for the absence of that story anywhere online is because it was, shall we say, horse plop to begin with. I’m sure that without sources I sound no more believable. TeddyBear was apparently a developer working on the project. 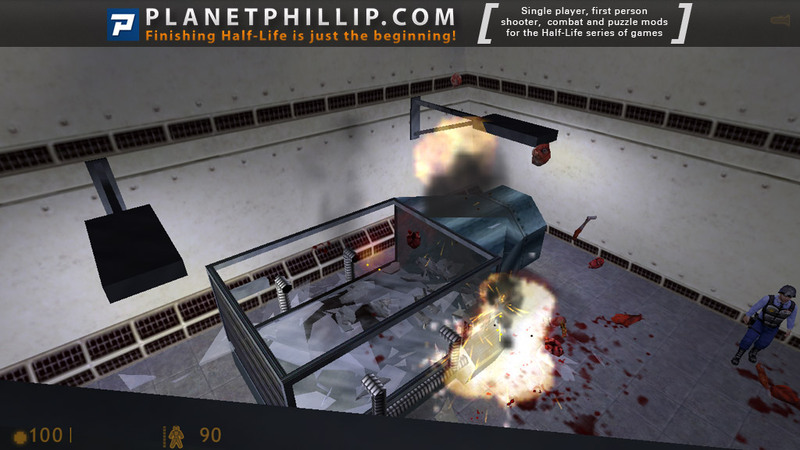 To summarize his points (in case that Mapcore thread blinks out one day), with developers working in their spare time, and with the mod’s “AAA scope”, it was a challenging project, and that complexity may have contributed to its never seeing the light of day. Contact between team members faded in 2009, but to the best of TeddyBear’s knowledge the game was still on track at the time. A couple of days after relaying that info on Mapcore, TeddyBear came back with news that he’d contacted Einar Saukas (Neil Manke’s programmer partner, who he’d worked with on a number of projects) and learned that a few months earlier, Einar had tried to contact Neil after some years out of touch. He was unsuccessful, I’m sorry to report, and that’s where things stand. If I can track down that damn post, I’ll be back with a link, but don’t get your hopes up. I’m irritated and baffled not to have bookmarked it, but them’s the breaks sometimes. Sorry. 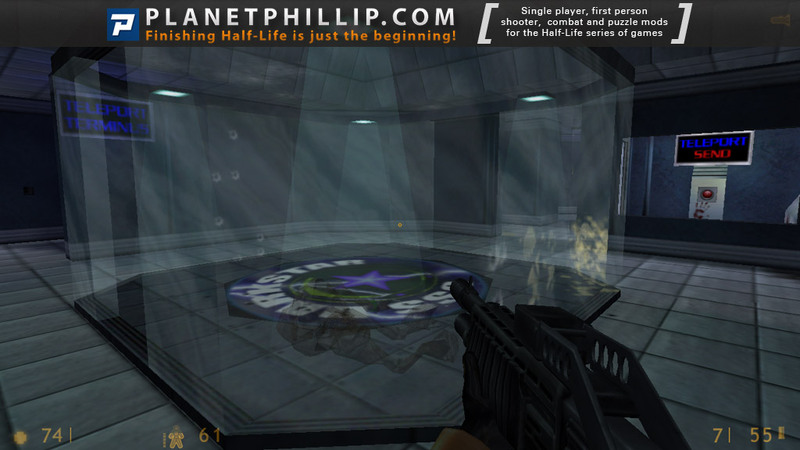 Being the first Half-Life SP mod i’ve ever played, i have quite fond memories of it. Neil Manke being the author you can expect some top notch and extremely creative (and fluent) level design, topping Valve quality at some points. The mod doesn’t feature any new weapons, and the texture work is pretty vanilla (although some sections of the ship do have new brushwork) but that doesn’t diminish it’s appeal. 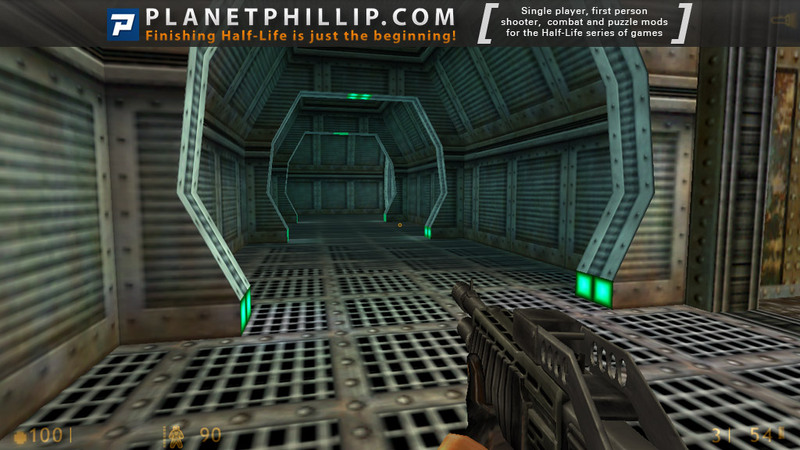 Plot development it’s pretty funny, USS Darkstar doesn’t ashames itself ripping off Alien (original Half-Life didn’t either) and that makes for a joyful and superbly funny ride. Enemy placement is spot on and the game has it’s fair share of exploration and platforming. 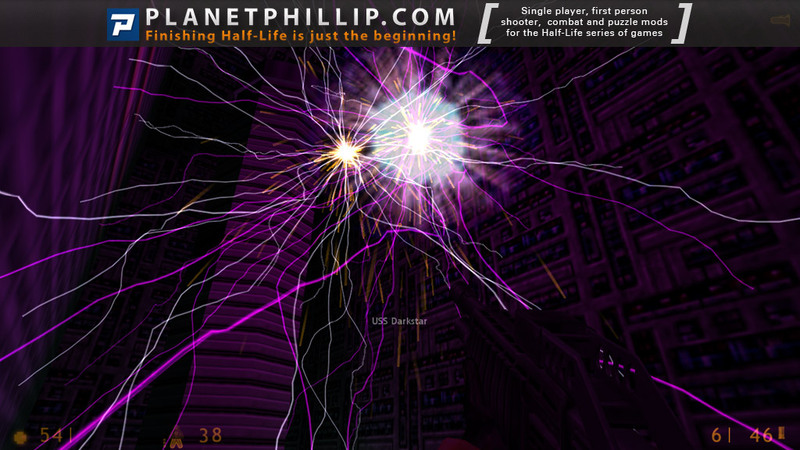 I’ll never forget that time i entered a portal and ended up being a mini-Freeman. Incredible Duke Nukem 3D knockback. Definitely, a 10/10. Which is even more amazing given the fact that this mod belongs to the early escene. You’ll fight mainly alien enemies in a wonderfully labyrinthine spaceship. This mod doesn’t lose creative steam as you move forward, with new ideas being presented to you constantly along the way. There’s secrets!! Be on the lookout for them.